CRM For WHMCS is a module created to expedite the management process of potential clients. You will be able to not only add new contacts and easily alter their status or labels on a Kanban board but also create accounts for them directly in the addon. 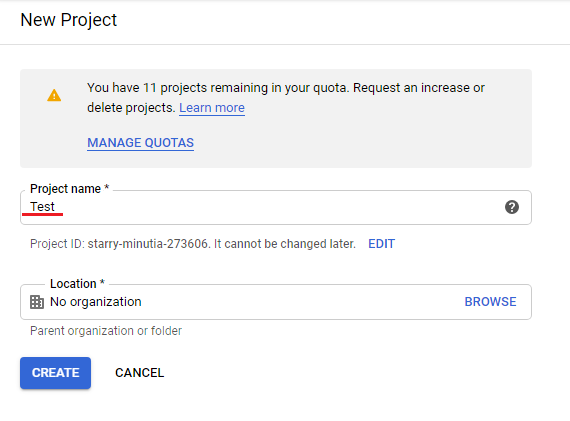 The module will allow you to send automated notifications, create quotes and notes as well as add custom fields to contacts' profiles according to your needs. What is more, all information about the contacts will be shown in a graphic form on the dashboard. 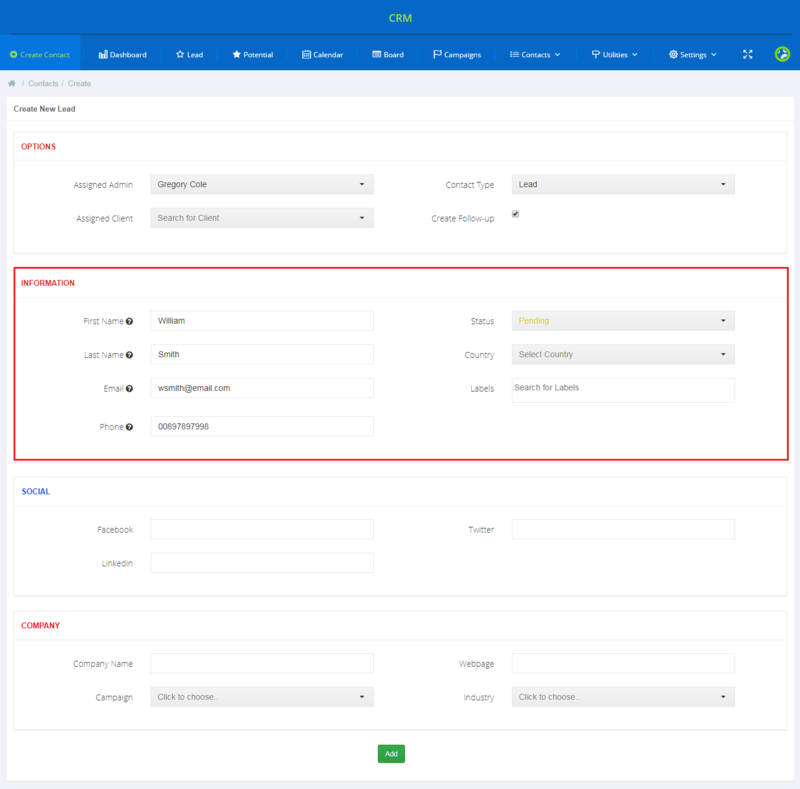 TIP: You can extend the functionality of CRM For WHMCS by integrating the module with Asterisk VoIP Center For WHMCS, Quotes Automation For WHMCS and SMS Center For WHMCS. 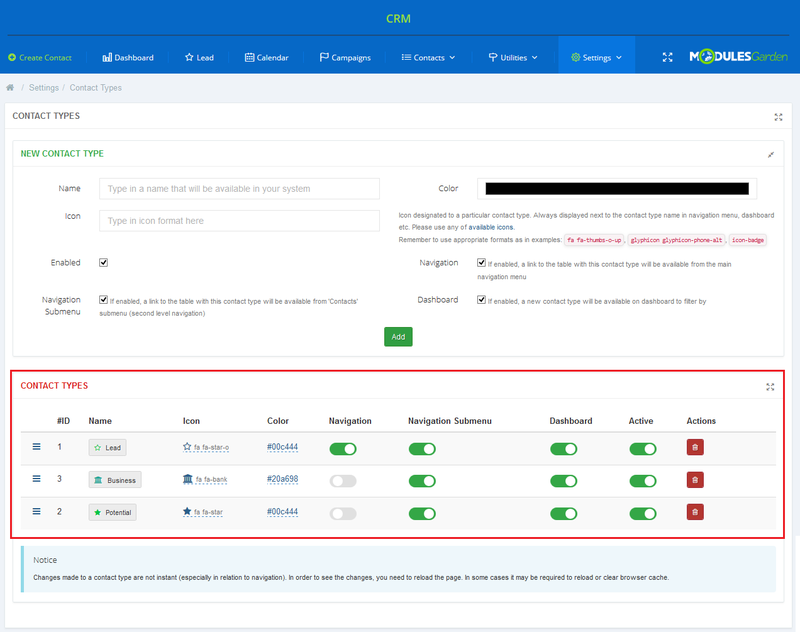 This tutorial will show you how to successfully install and configure CRM For WHMCS. 4. 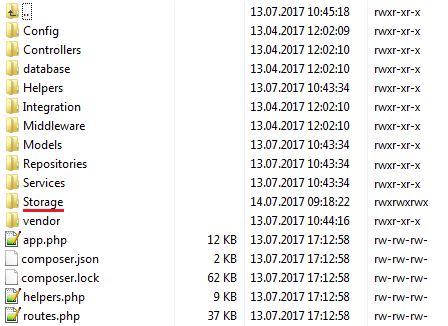 When you install CRM For WHMCS for the first time, you have to rename the 'license_RENAME.php' file. The file is located in 'modules/addons/mgCRM/license_RENAME.php'. Rename it from 'license_RENAME.php' to 'license.php'. 6. The next step is to set up the 'Storage' folder as recursively writable. It is located in 'your_whmcs/modules/addons/mgCRM2/app/'. Log in to your WHMCS admin area. Go to 'Setup' → 'Addon Modules'. 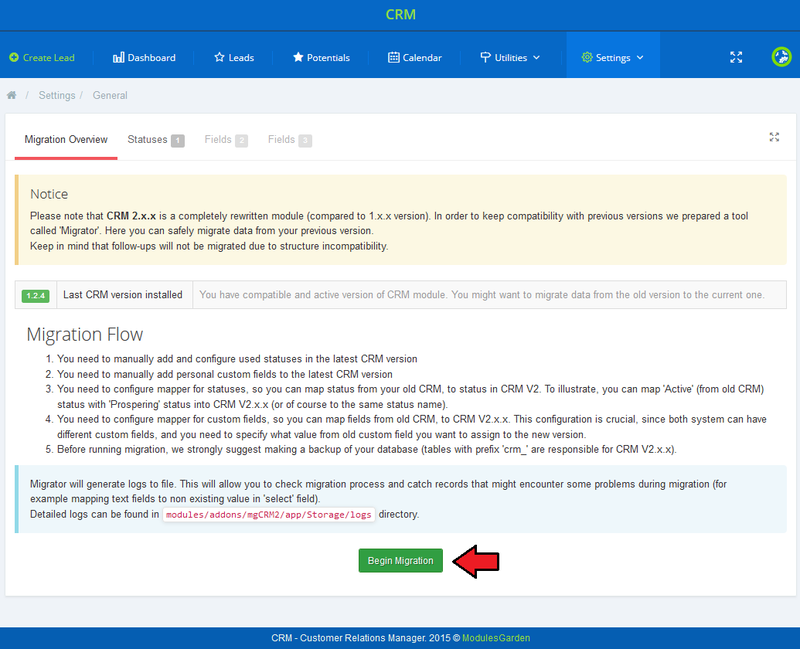 Afterward, find 'CRM' and press the 'Activate' button. 8. Next, you need to permit access to this module. To do so, click on the 'Configure' button and tick checkboxes to assign desired admin roles. 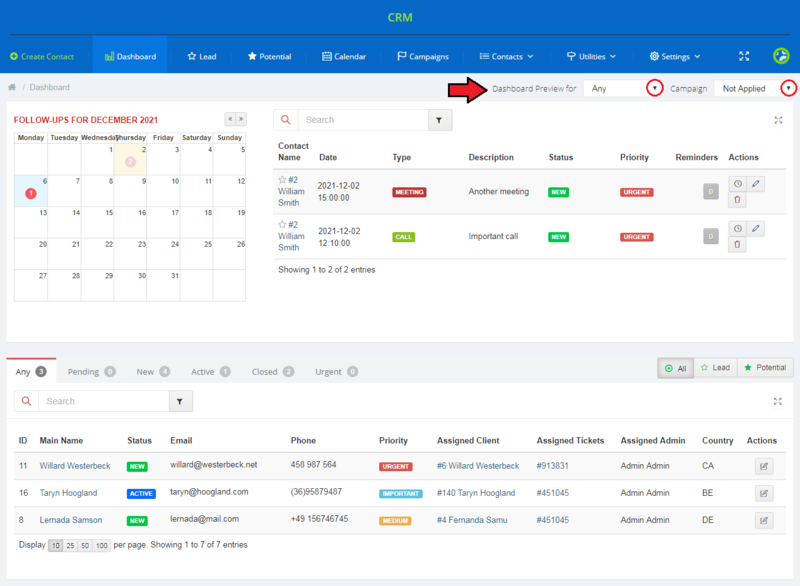 CRM as a standalone page - if selected, the CRM page will be visible in the standalone mode by default, no matter which template is used. Full Access Admin - select admins who will have full access to your module. Access Control - select admin groups that will have access to your module. 9. 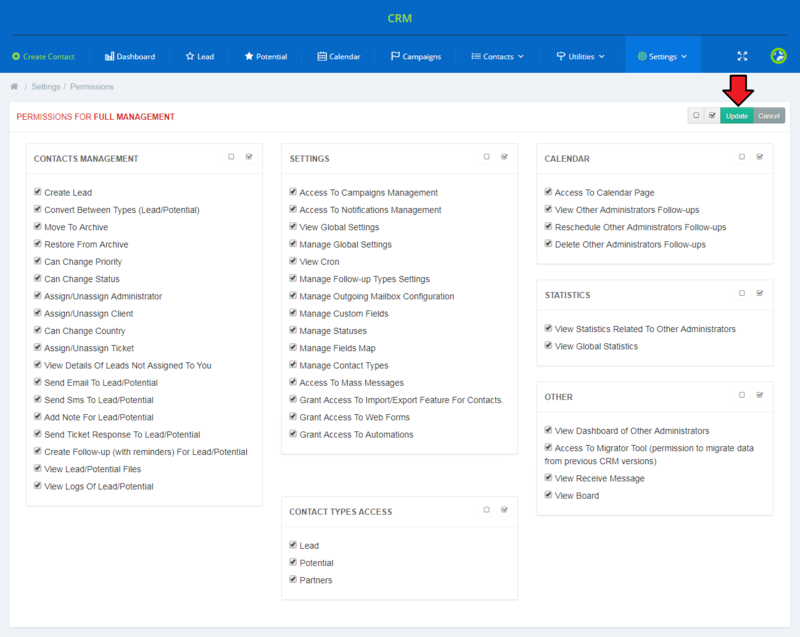 Now, you have to set up a cron job, which can be found in CRM Addon → 'Settings' → 'General' → 'System Overview'. We advise to set up the cron as frequently as possible to send email notifications, 5 minutes interval is recommended. 10. 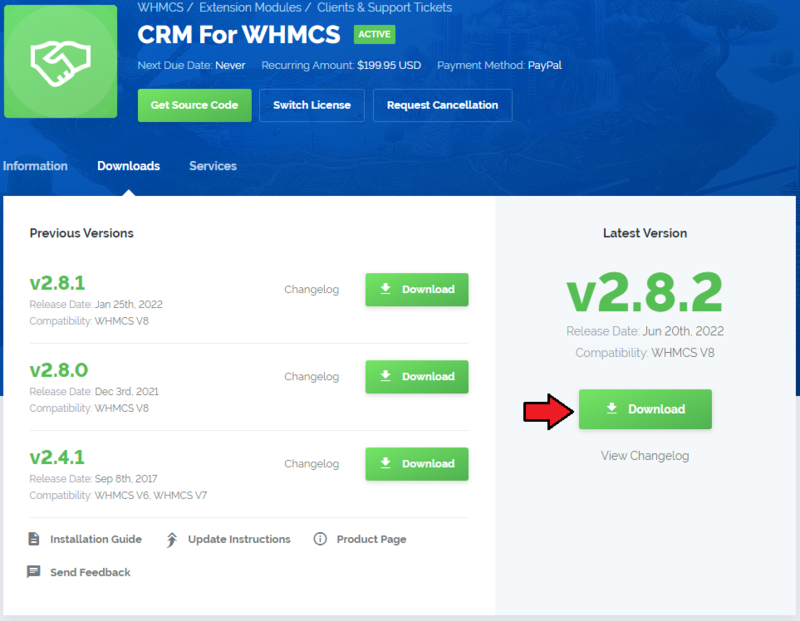 You have just successfully installed CRM For WHMCS! 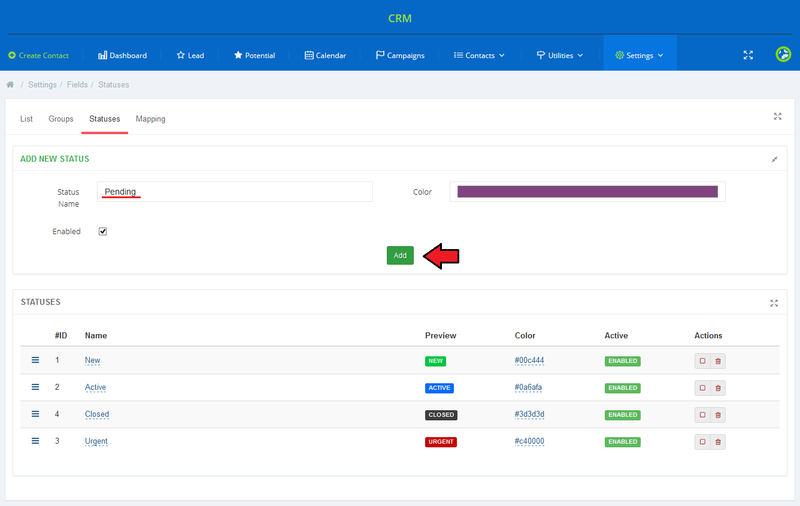 You can access your module in 'Addons' → 'CRM'. 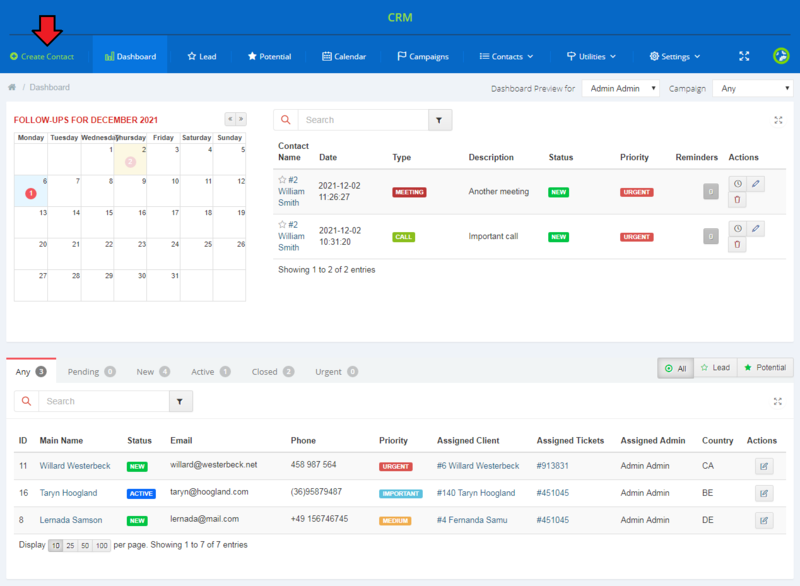 CRM For WHMCS is a module which allows you and your staff to manage relations with your current as well as possible clients in one place. 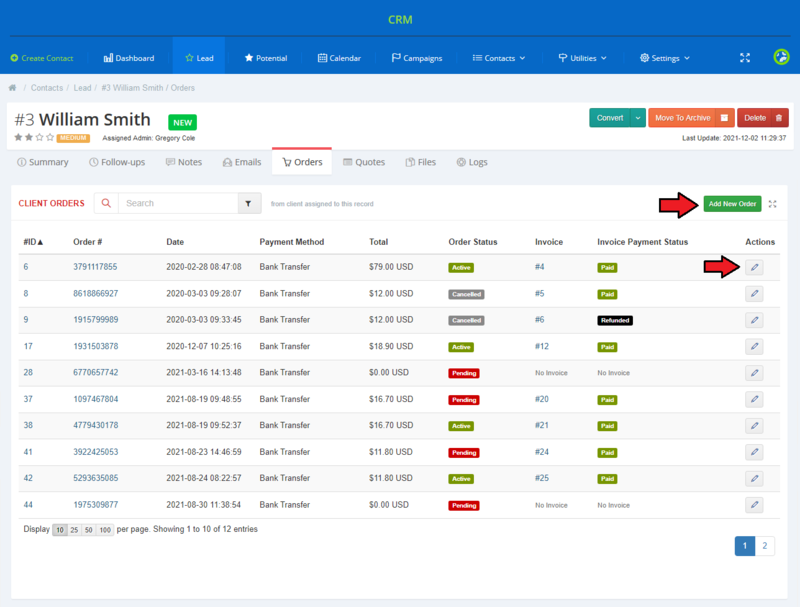 When you proceed to 'Addons' → 'CRMv2', you are automatically moved to the application dashboard. View follow-ups on the calendar, the list of recently added contacts and last activities. It is possible to adjust the dashboard view according to applied filters. 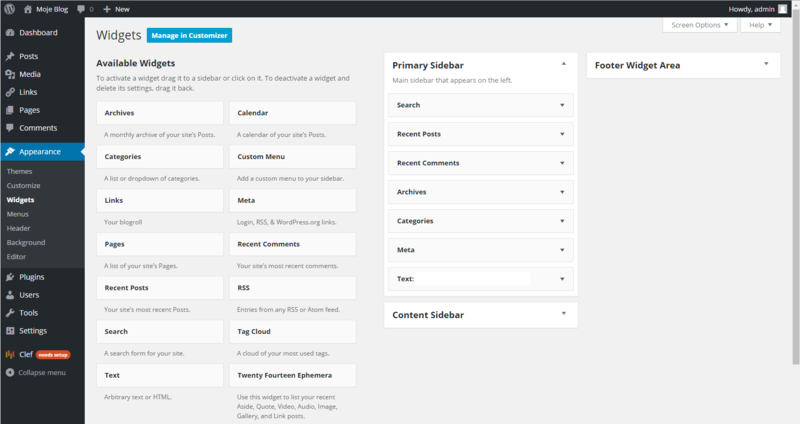 For example, preview the dashboard of a selected administrator. You may also add campaign filters. Simply choose which campaign records shall be viewed. Select '--Not Applied' to disable this filter. Use the cross-arrows icon to switch into the standalone mode. 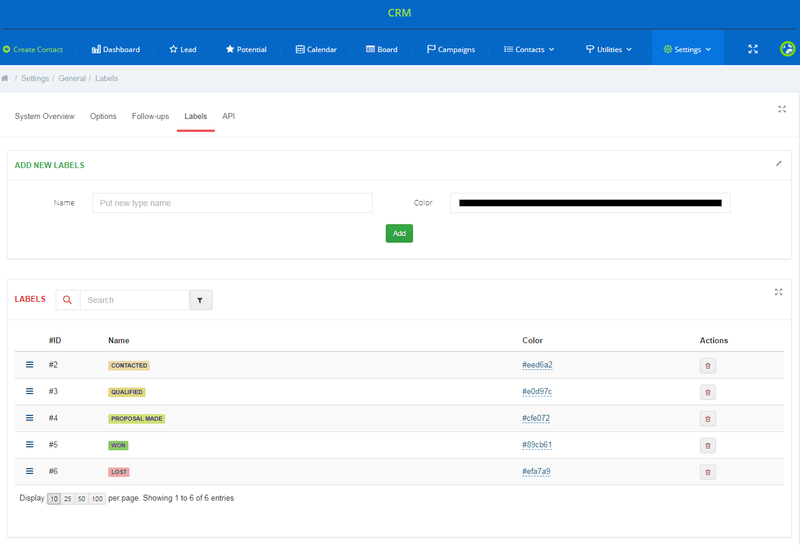 Your CRM module pages will be then possible to access from outside of WHMCS. Press it again to return to the WHMCS view. To create a new contact, press the button marked on the screen below. You will be moved to a contact creation form. As you can see below, fields are divided into two sections: Options and Information. Fill out the form and press 'Add' to add new contact to the list. If you have previously added and enabled custom fields, they will be visible here as well. Immediately after a new contact has been added, you will be moved to its summary where you can find/edit some additional data. In the 'Actions' column you will find a list of useful operations which can be performed on a contact. When clicking on the dropdown menu, you will see such options as 'Convert To Potential/Partners' , 'Move To Archive' and 'Delete' . 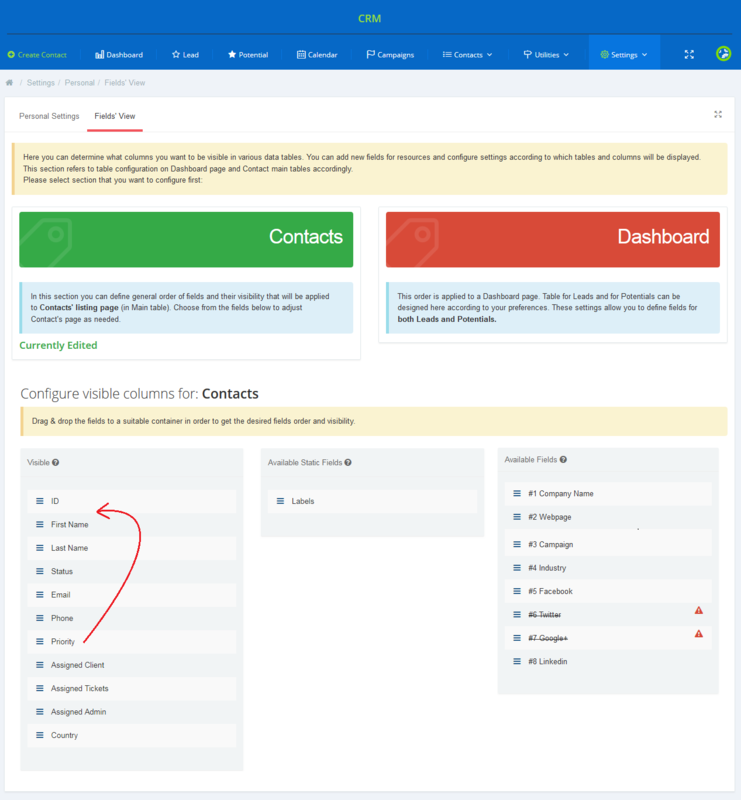 Note: The 'Call Out' functionality is also available but only if you have installed and configured Asterisk VoIP Center For WHMCS properly. Now, let us proceed to the contact itself. Press the pencil icon to move to the contact's summary page. You can also filter your contacts by e.g. typing in a client's phone number into the 'Search' field. 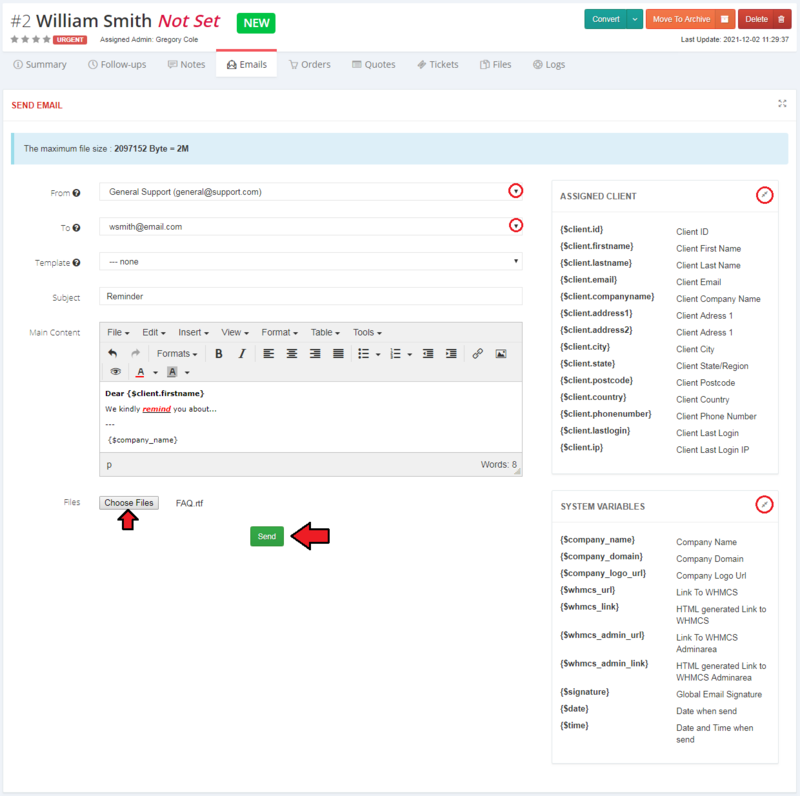 You can also perform bulk actions on multiple contacts at once. To edit any of the options in the contact summary page, simply press a pencil icon that appears when you hover your mouse cursor over the option. Every time you editing any information, please press the green confirmation button to save the changes. ticket on the basis of which the contact was created, contact details, and any campaigns the client belongs to. The module allows you to assign a client account to the contact. You can do it in two ways: by creating a new contact or by selecting an existing client and assigning him/her to the contact. In the same way, you may assign a support ticket to a contact. Then, you can make a background check on the client in an easy and quick way. When you hover over the email address of a contact, two icons will appear. Press the first one and you will be redirected to the section which allows you to send email messages. If you decide to use the edit icon instead (2. ), you will be able to type in any email address. Just like with clients and tickets, you may also assign your contact to a campaign (if you have any). 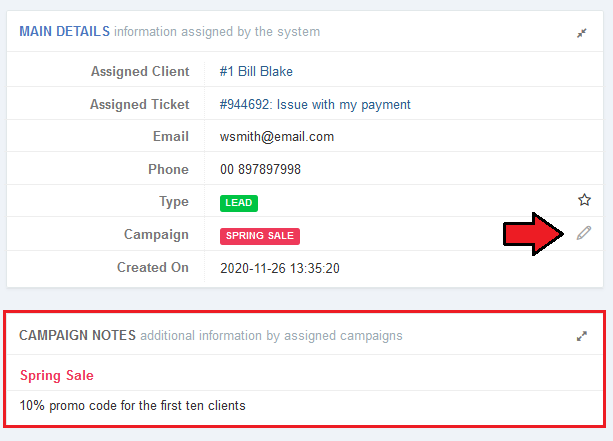 When assigned, campaign details will appear in a separate widget. Follow-ups allow you to send email templates or text messages to contacts and staff members and create ToDo entries. Any follow-up can be rescheduled (1.) or removed (2.) using buttons in the 'Actions' column. You can search for the desired follow-ups using the search box and sort them by type. Date - (required) the time when the notifications will be sent. Description - (required) a short description of a follow-up, it will be later on visible in the follow-up list. Follow-up Type - allows you to define the type of a follow-up and facilitate their better identification. Admin - the admin to whom ToDo entry will be assigned. The last step is to define reminders. We will briefly describe each of them below. 'On Create' - Notification is sent to the admin assigned to a contact immediately when a follow-up is created. 'Follow-up Due Date ' - Notification is sent to the admin assigned to a contact on the set date. 'Before Follow-up Due Date ' - Specify time (date/hours/minutes etc) before the Follow-up Due Date to send the notification to the admin assigned to a contact. 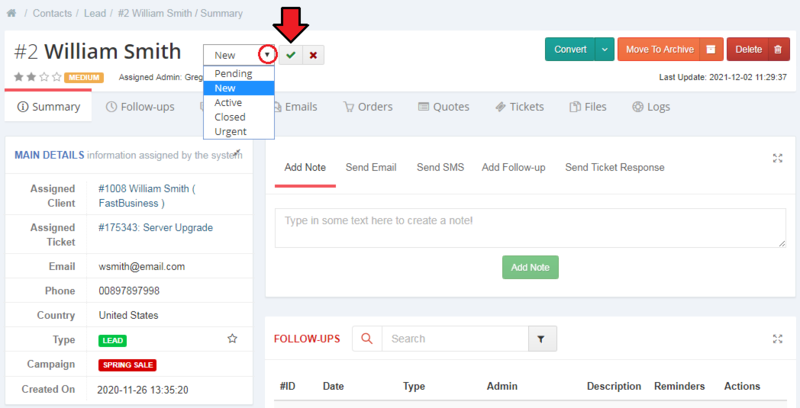 'On Create' - Notification is sent to the client assigned to a contact immediately when a follow-up is created. 'Follow-up Due Date ' - Notification is sent to the client assigned to a contact on the set date. 'Before Follow-up Due Date ' - Specify the time (date/hours/minutes etc) before the Follow-up Due Date to send the notification to the client assigned to a contact. Choose whether you wish to send reminders via email or SMS (if SMS Center For WHMCS is activated) or both. Once the option is marked and the path is chosen, you will need to fill out the details for the chosen reminder, separate for emails and SMS messages. Press 'Add Follow-up' to finalize the process. Added follow-up will be displayed on the list of all follow-ups of the contact. Use action buttons to delete, reschedule or edit the follow-up. In order to reschedule a follow-up, you will always need to provide a reason. 'Notes' section enables you to make and manage notes about the contact. Any existing note can be modified and hidden as presented below. Please note that only hidden notes can be deleted. To show hidden notes, press 'Display Hidden'. Any staff member can send an email from the profile of any contact. As you can see, you can manually fill out the email subject and content as well as attach files and quotes. Additionally, you can use WYSIWYG editor with merge field variables to make your massage more readable. Note: The maximum attachment size is based on the 'upload_max_filesize' and 'post_max_size' records from your 'php.ini' configuration file. 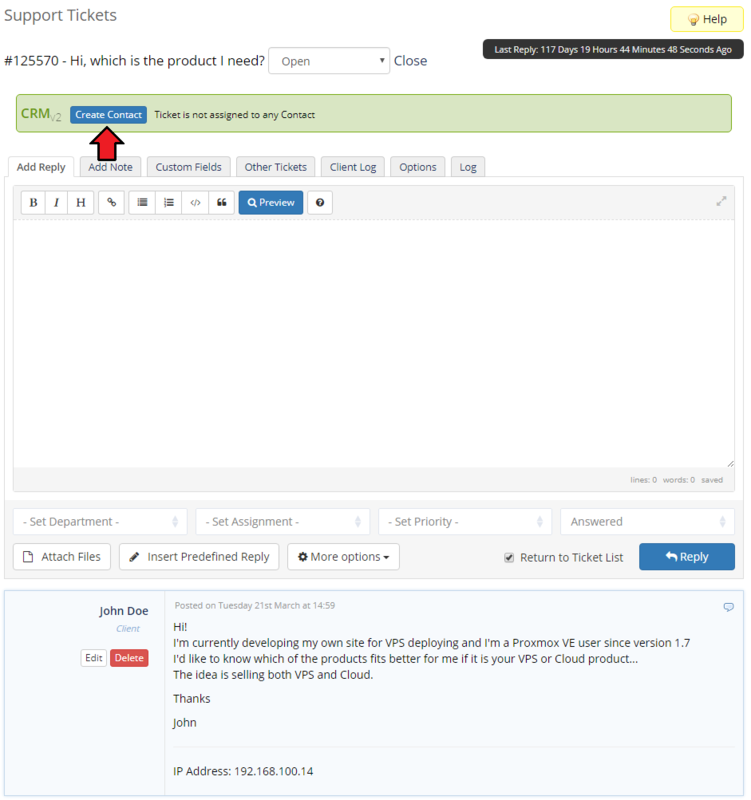 Alternatively, you can choose one of the WHMCS email templates (from the 'CRM Messages' group type) to be sent. You can also select the mailbox from which the message will be sent. 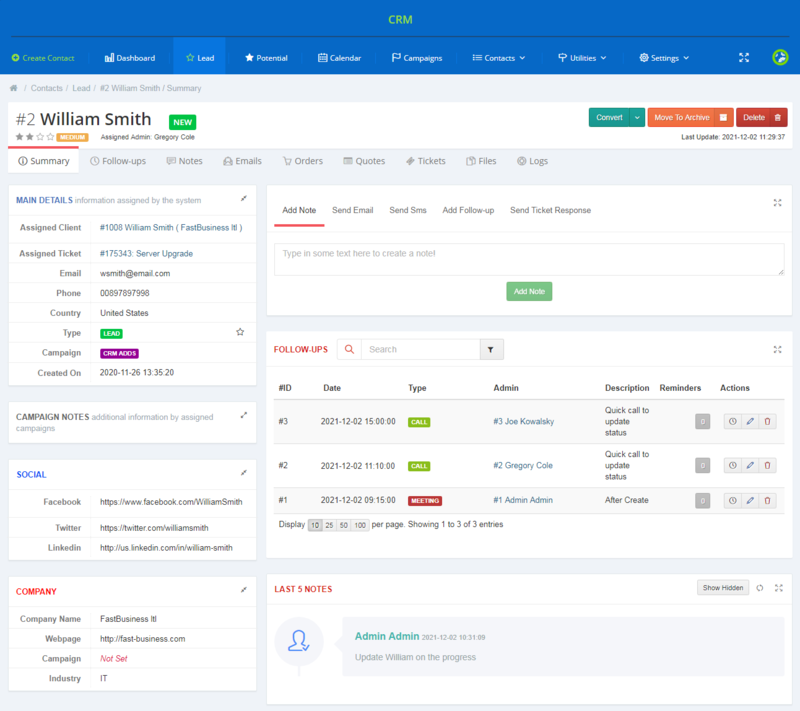 These mailboxes are obtained from the CRM 'Mailboxes' , WHMCS 'Support Departments' and 'General Settings' sections. If you do not want to manually select mailboxes every time, you can set the default one in the 'Personal Settings' . At the bottom of the emails section you will find 'Conversation Log' . 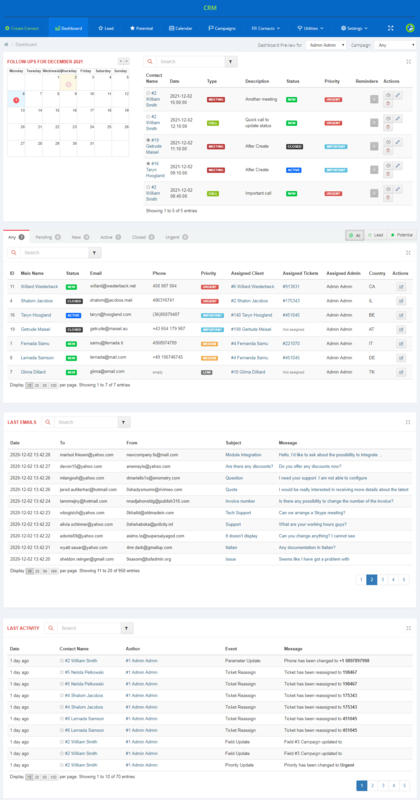 It contains all messages sent to the customer (marked with a green arrow) as well incoming messages (marked with a red arrow), if they have been configured in Mailboxes. 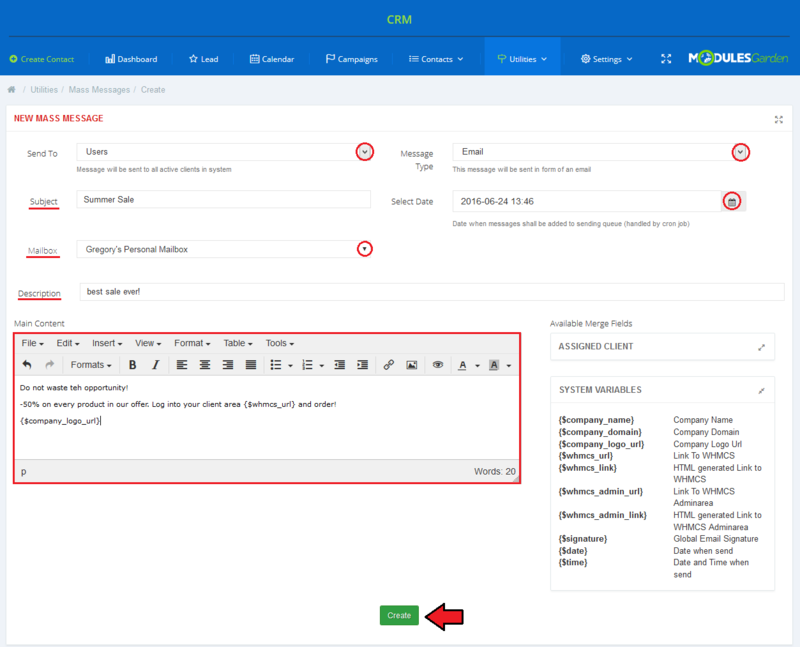 If you have integrated the module with the SMS Center For WHMCS, here you will also find sent SMS messages. The information about any attachments, follow-ups and reminders linked to the message will also be shown. Finally, to read the message, simply click on its subject and a new window with its contents will appear. Move to orders page where you can place orders for the contact. 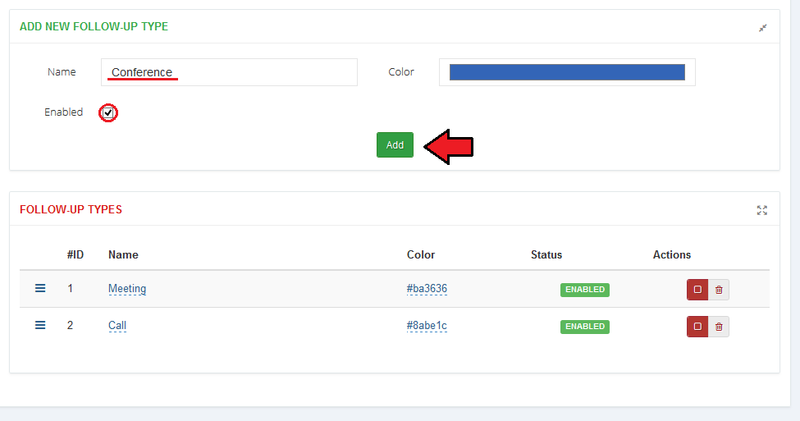 Press 'Add New Order' and you will be redirected to your WHMCS page where an order can be placed. Quotes can be created for each CRM contact. 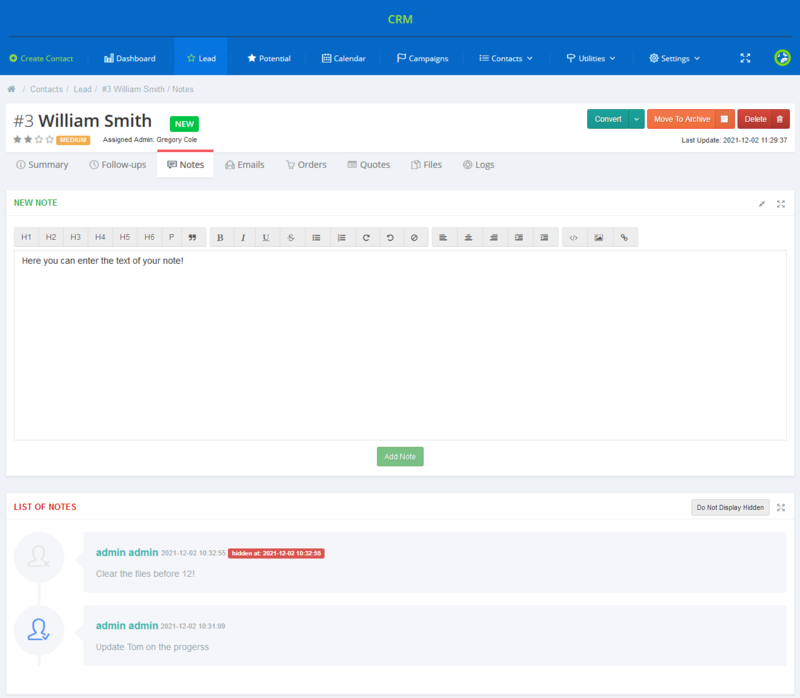 As you can see on the screen below, in the 'Quotes' section of the contact page, brief information about quotes assigned to the contact is displayed. You can edit any of these quotes through using buttons in the 'Actions' column. You can also create a new quote for the contact. To do so, press 'Add New Quote' as shown on the following screen. Now, create a quote for your contact. You can do it in two ways. If a client is assigned to the contact, they will be automatically linked to the quote. Otherwise, the module will ask you to fill out account details of a new client to complete the quote. In the second scenario, a client's account will not be created in the process unless you use the 'Convert to Invoice' functionality. 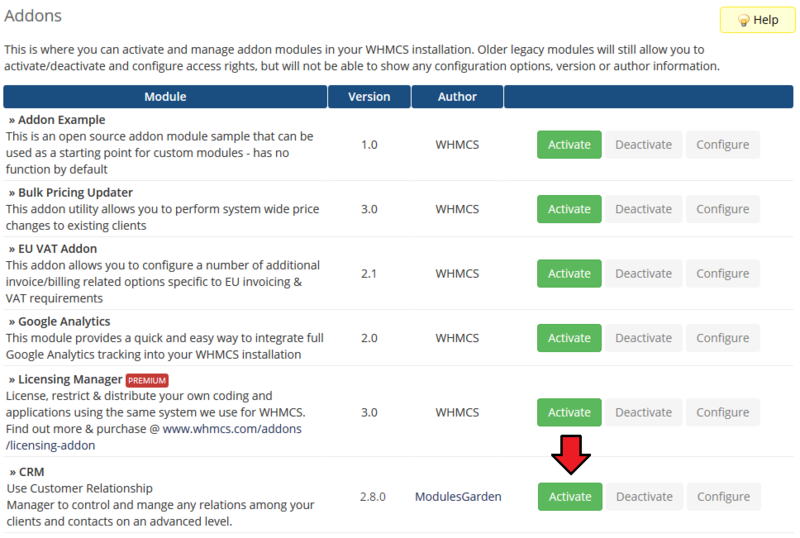 Important: For extended functionality related to quotes, we recommend our Quotes Automation For WHMCS. It extends quotes with functionalities like adding product addons and domains to the quote, their automatic provisioning, and quote acceptance from the client area. The 'Tickets' tab displays all tickets created by a client. If you want to create a new ticket for the client manually, click 'Add New Ticket'. The 'Files' tab allows you to upload and manage files related to your contact. To upload a new file, select the file to upload and describe it shortly. Then press 'Upload'. Note: The maximum file size is based on the 'upload_max_filesize' and 'post_max_size' records from your 'php.ini' configuration file. 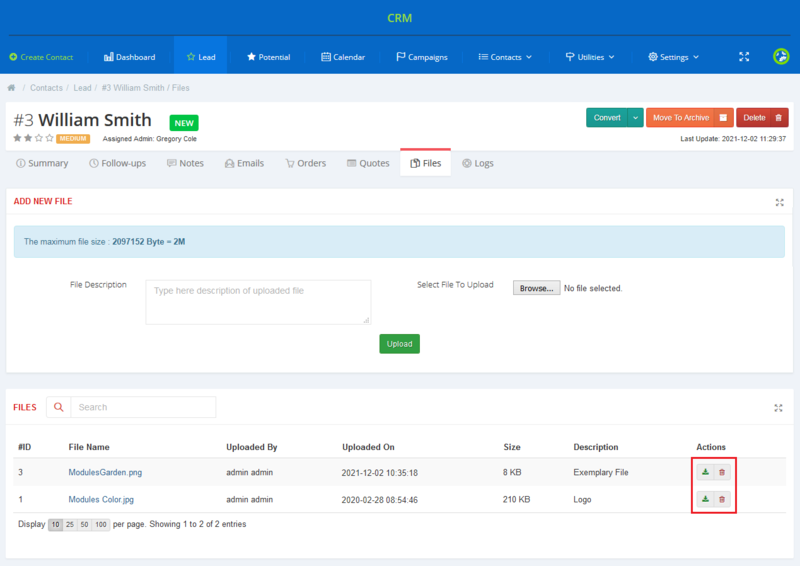 Any uploaded file can be downloaded from CRM by pressing its name or using action icons. It can be also removed by clicking on the dustbin icon. To view the latest actions performed on the contact, go to the 'Logs' tab. As you can see, it contains all details you might be interested in. The 'Logs' page, apart form displaying all logs concerning the contact, contains also a search box. The search option allows you to find logs on actions performed by specific administrators, at a desired time and related to specific events. On the following screen you can see logs associated with actions of a specific client. Move to the 'Calendar' tab to access a fully manageable and adjustable calendar. Switch between days, month and week view to have a clear and precise insight into your scheduled events (click on a selected day to see the details). Note: You can change the first day of the week in the calendar to any another day in 'Settings' → 'General' → 'Options' → 'First Day Of The Week' option. 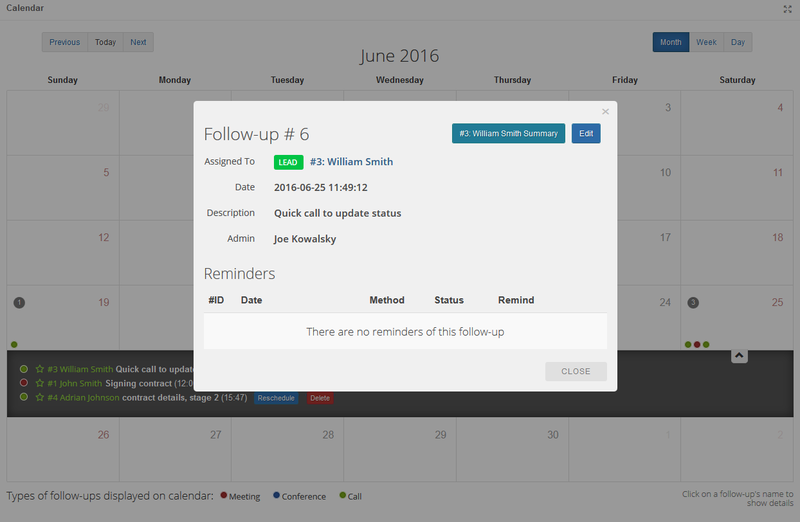 Under the calendar you will notice a legend of follow-up types displayed in the calendar. 'Board' tab can be used to conveniently present the current stage of business relationships with your contacts. Using the drag & drop feature, you can easily move your contacts from one column to another. The moved contact will be then automatically assigned to a specific label that is represented by the given column. By default, when you open the board for the first time, the only available column will be the 'Contact list' . To add new columns, you must first add them in the 'Settings' → ' General' → 'Labels' section. Simply enter a new label name and assign a color to it for easier identification. You may add as many labels as you wish. Now return to 'Board' . Click 'Add Label' to add your just created label as a new column. Confirm and repeat this step until you reach the desired number of columns. Finally, the use drag & drop feature to move your contacts between columns. 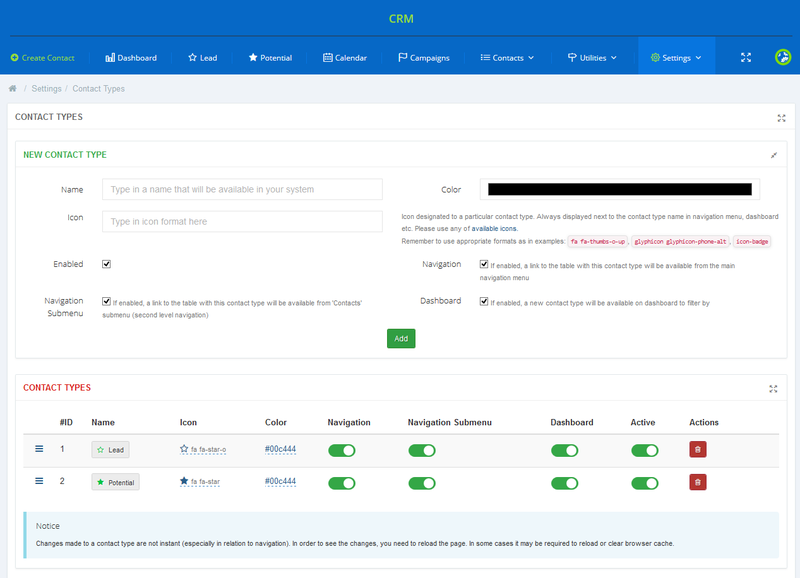 Another functionality that CRM For WHMCS has to offer is the possibility to create customized campaigns. 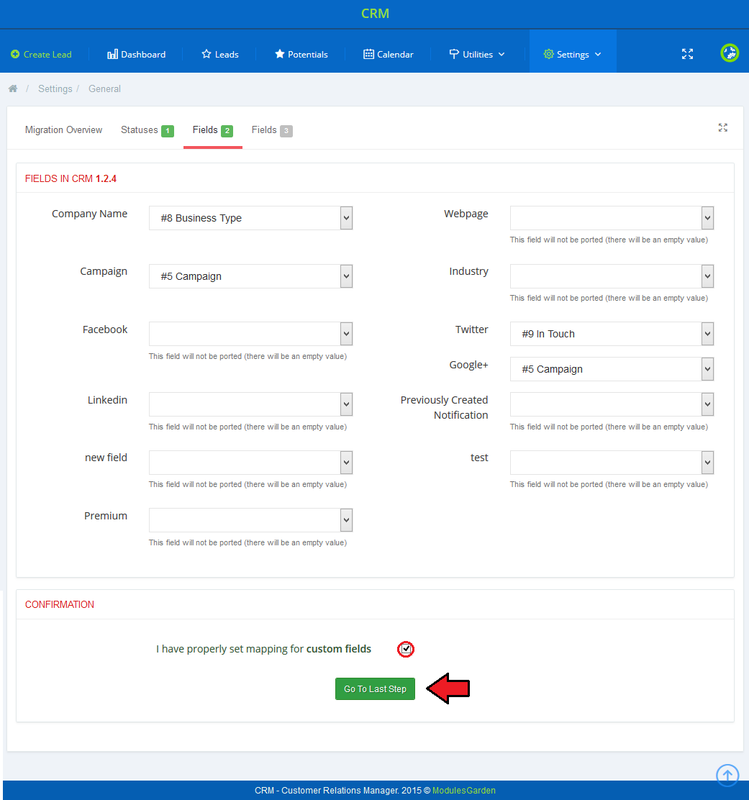 If you decide to apply this option, you will be able to create various campaigns with selected contacts included and filtered according to your personal configurations. Let us check how this functionality works. In order to add a new campaign, use the 'Create Campaigns' button. Start with filling out some basic data about the campaign such as name and description. Select a color that will be used to distinguish this particular campaign from others. 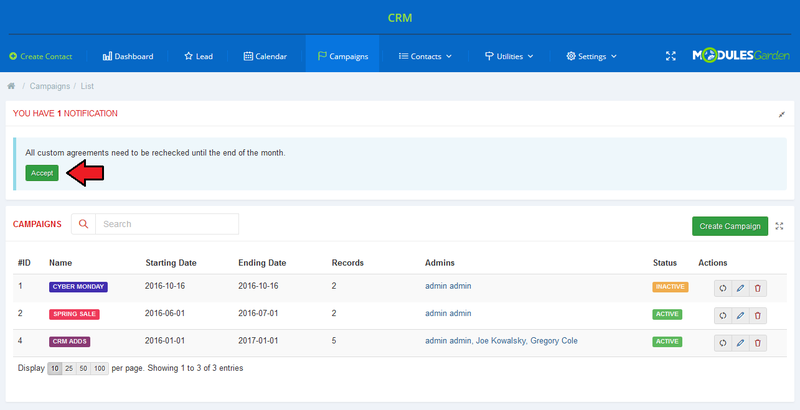 Assign admins who will have access to the campaign entries, and provide beginning and ending dates. 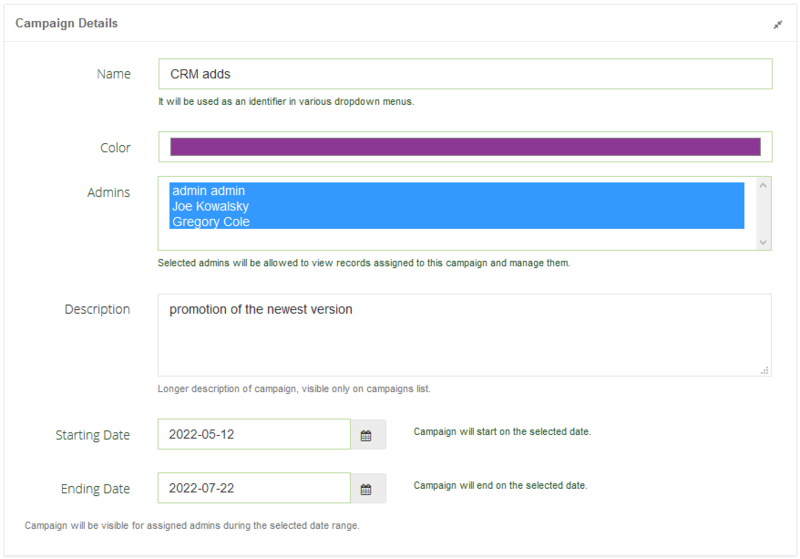 In the second part, you will need to select filters to assign desired record to this campaign. You may use both predefined system fields and your own custom fields. Find all created campaigns stored together on a convenient list with the most crucial data close at hand. Due to the wide variety of possible configurations, the 'Settings' section has been moved underneath to make the presentation more precise. 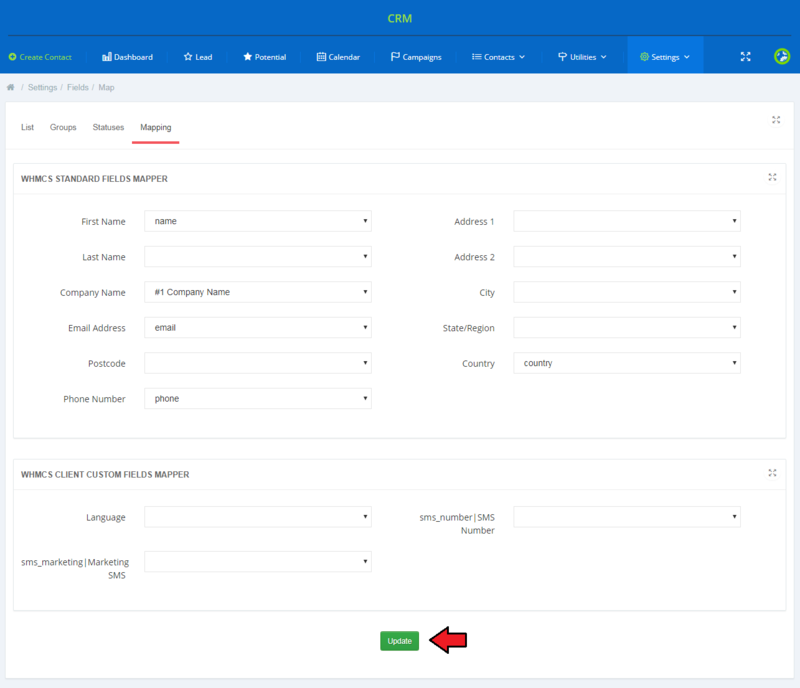 In the 'Settings' → 'General' page of the module you can check its current status, enable major features and define follow-up settings. In 'Cron Details', you can find all information about the cron such as its path, last execution date and interval between cron runs. In 'Additional Options' , you may enable quotations for contacts and assign contacts to administrators. You can also change the first day of the week for the calendar. In the next section of General Settings there are few options allowing to configure follow-ups. First, activate alarms which will show pop-up notifications on forthcoming follow ups. Next, select the 'Follow-up Per Day' option if you want the follow-up to be set on a given day only, not a specific hour. You may also choose email template used to notify admins about a follow-up being rescheduled. Note: Pop-up alarms are sent once per minute. If a follow-up starts e.g. at 12:15, the alarm might be triggered at 12:14. Moreover, if the 'Follow-ups Per Day' option is enabled, then, if a follow-up starts e.g. on 07.08.2017, the alarm might be triggered on 06.08.2017 at 11:59 PM. 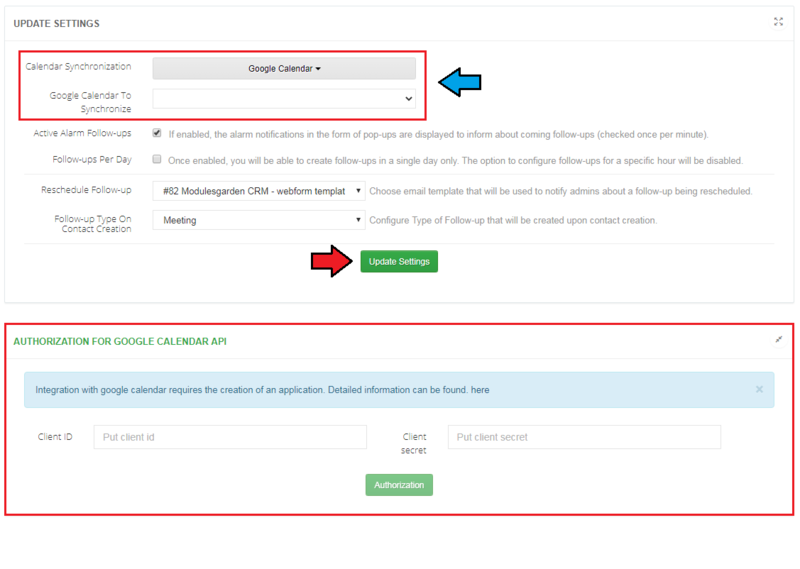 Additionally, you can enable follow-ups synchronization with WHMCS and Google Calendar . No additional configuration is required for the WHMCS calendar. 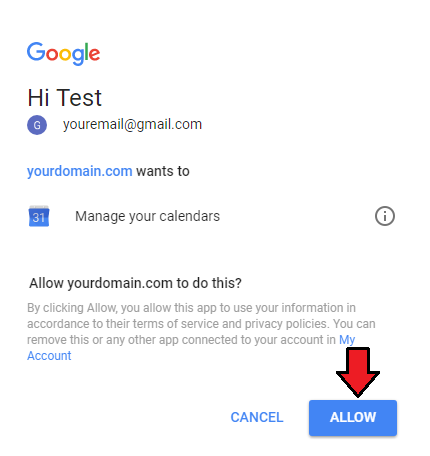 To configure Google Calendar, follow the steps described here. At the end, you can add a new follow-up type by entering its name, assigning a color and finally enabling it. Once added, you will see it on the list of available follow-up types below. To set up a connection with Google Calendar, go to 'Settings' → 'General' → 'Follow-ups' . Then, select Google Calendar from the dropdown menu and click on 'Update Settings'. You will see a box to configure the API data. 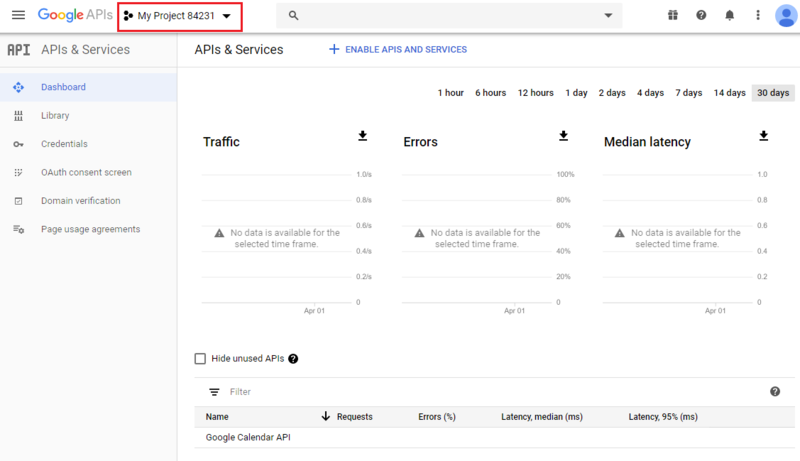 If necessary, find your 'Client ID' and 'Client Secret' , go to 'Google API Manager' and log in. In 'API Manager', go to the 'Library' and select Calendar API. Accept 'Terms of Service', if shown. 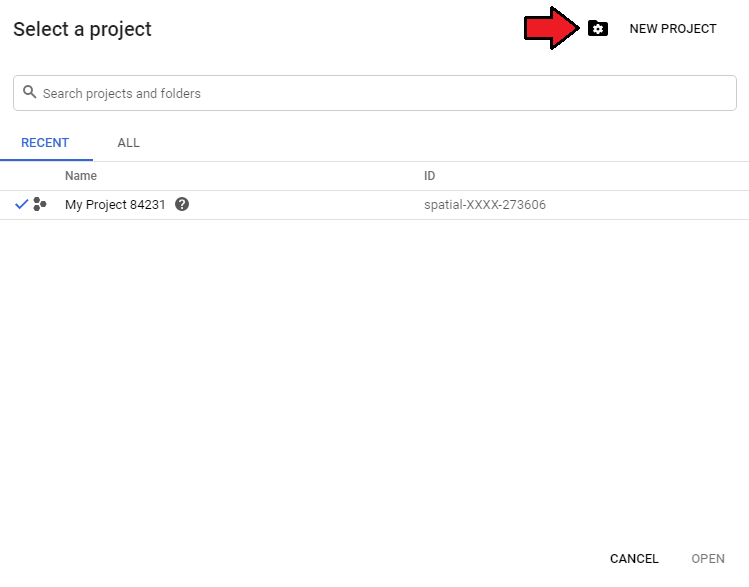 Next, press 'Create Project', and enter a new project name. 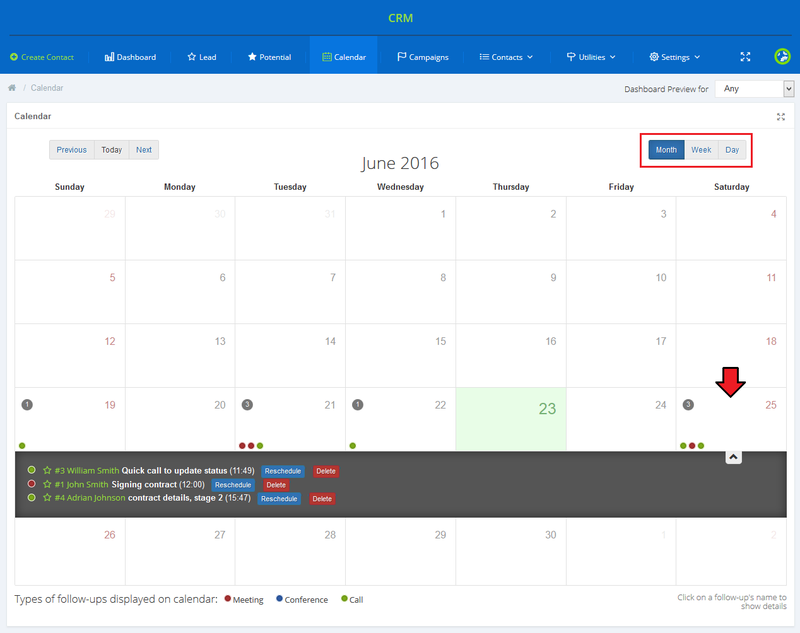 After project creation, you will be ready to enable calendar API. Now, press the 'Credentials' tab. Click on 'Create credentials' and select '0Auth client ID'. 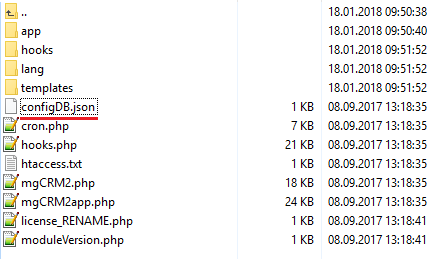 Note that your 'admin' folder might also have a custom name. You will obtain your 'client ID and 'client secret'. 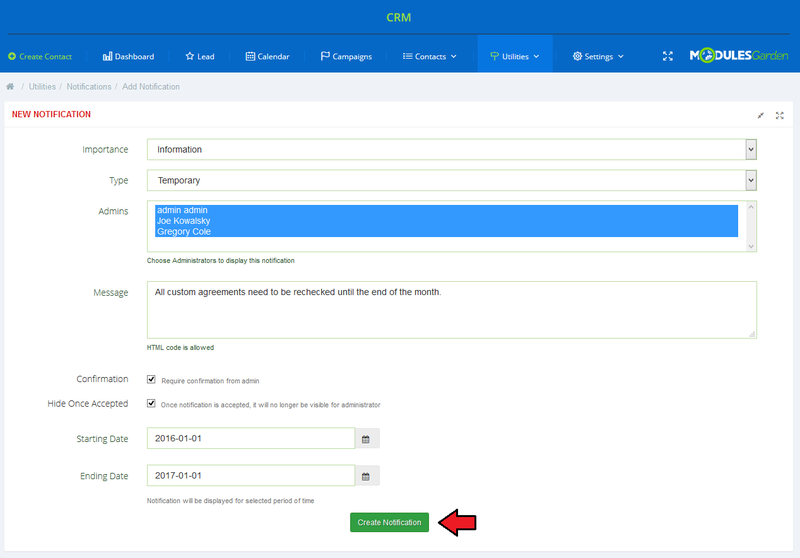 Now, copy and paste them into your CRM authorization settings. In the last step, allow the authorization. Your Google calendar should be now synchronized with CRM follow-ups. 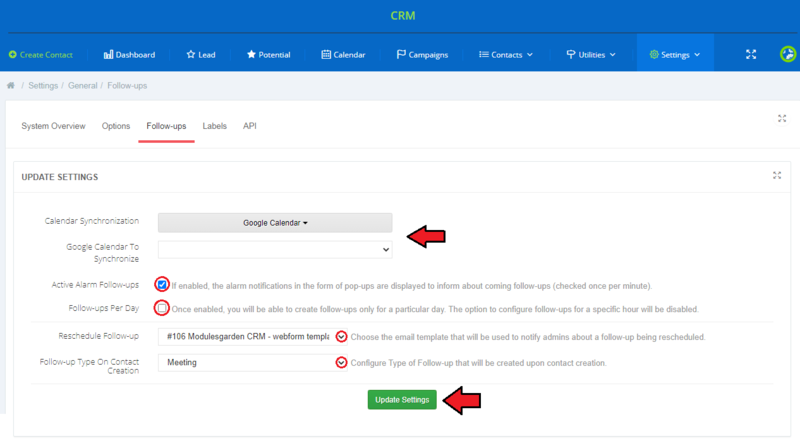 Please note that this synchronization will work only for newly created follow-ups and only in one direction, that is from CRM module to Google Calendar. Here you can add your own different coloured labels, which can then be assigned to your contacts for easier identification. Labels can also be used as columns on the Board view. Click here for more information. Once you have created labels, you can assign them directly from the contact view. Note: If you want, you can also assign multiple labels to a single contact. You can also display labels e.g. on the list of your contacts, by adding this field in the 'Fields' View' section. 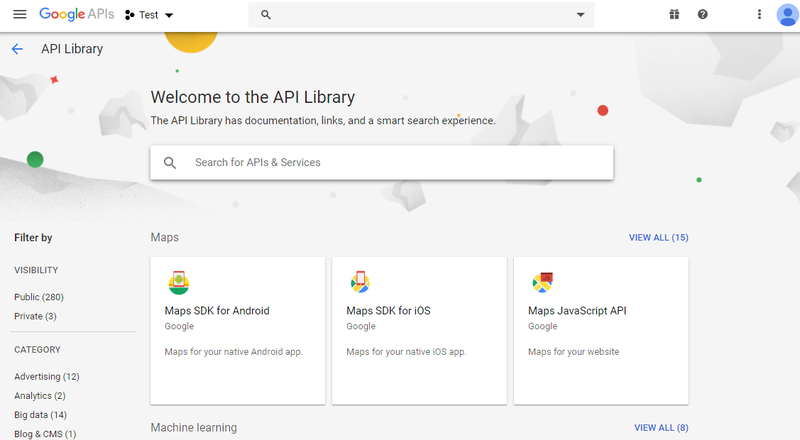 You may easily connect with our module through its own API. To learn more details, please visit this page. Provide URL to your avatar in order to personalize your CRM according to your needs. 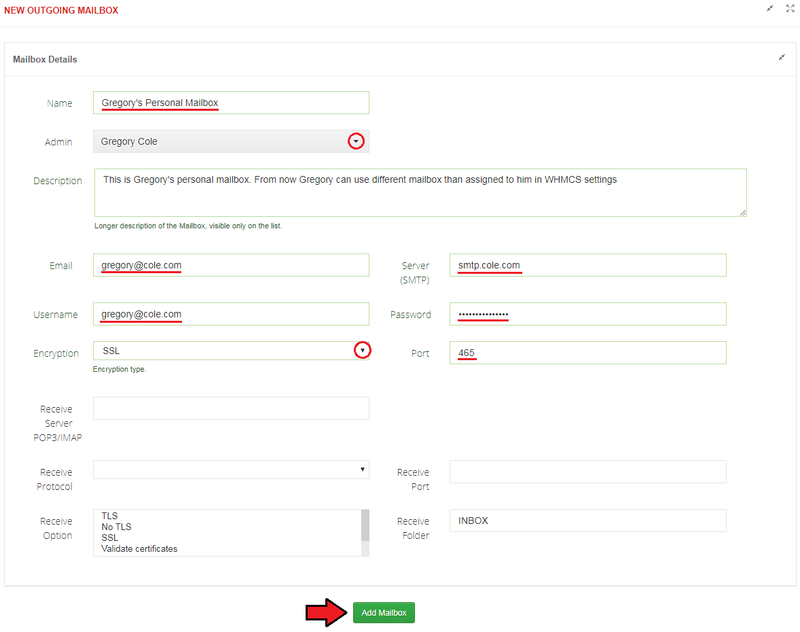 Also, choose the email address which will be used by default when sending email to a contact. 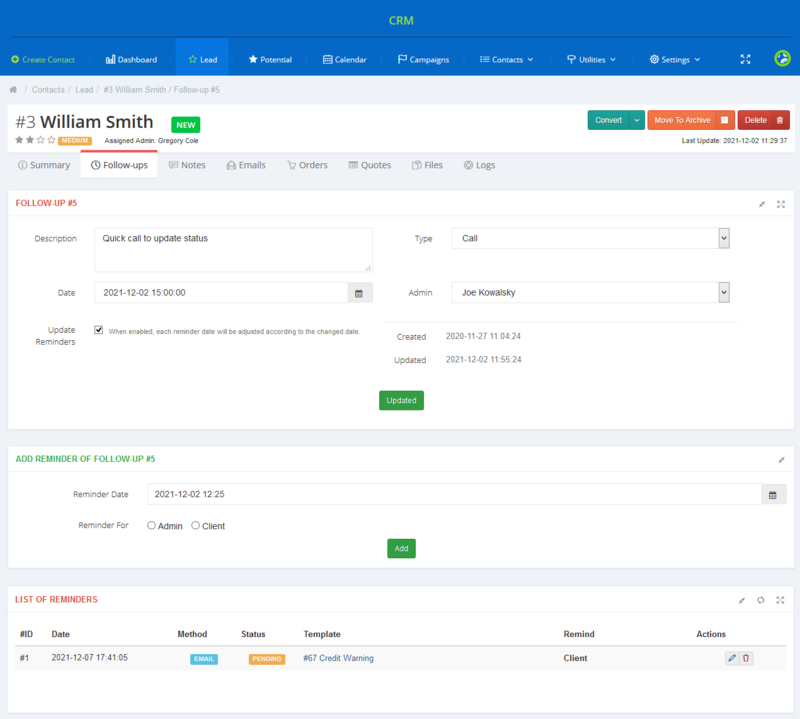 Available mailboxes will be obtained from the CRM 'Mailboxes' , WHMCS 'Support Departments' and 'General Settings' sections. (Contact page and Dashboard). Click on every section one by one to set its view. 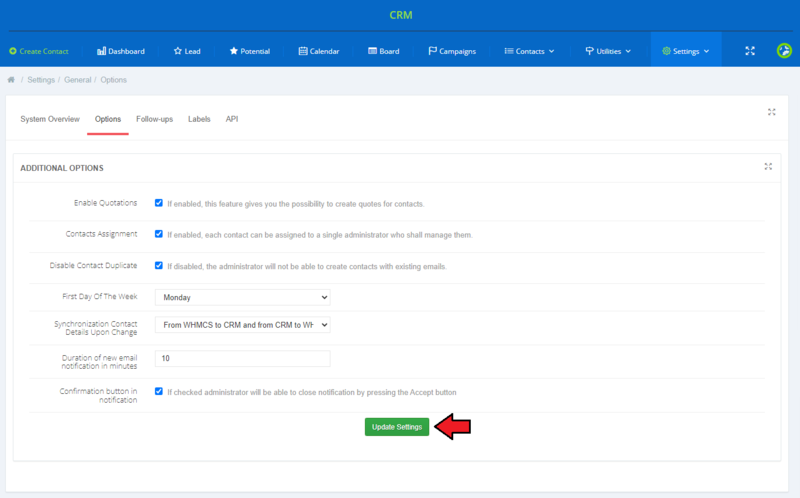 In this section, custom mailboxes can be added and then assigned to administrators who can then use them as default for sending emails to contacts or receiving emails directly through the CRM module. This also might be handy if you want to use different mailboxes than those configured in the WHMCS settings. To begin, press the 'Create Mailbox' button. If you want to configure outgoing mailbox, provide the name that will be shown in the contact's mail massage. Next, choose the admin to whom the mailbox shall be assigned and fill in the remaining fields with your mailbox data configuration. Press the 'Add Mailbox' button when ready. From now on, when the admin wants to send an email to a contact, they will be able to use the configured mailbox. For incoming mailbox, additionally provide your POP3 or IMAP server, choose receive protocol with security options, define port as well as receive folder. Note: You can select multiple receive options if required by your mailbox. From now on, when the contact sends a email message to a mailbox address, it will be shown on the contact's emails tab at the 'Conversation Log' as well as in the 'Utilities' → 'Received Messages' section. By clicking on the email subject, a new window with the content of the received message will appear. Each field, regardless of its type, has its name, description, assigned group and, obviously, its type. On the following screen you can see an example of a dropdown type custom field. To add a field, press 'Create Field'. Note: Fields can be also used for a web forms. This is the place where groups are created to segregate fields. Once you already know how you want to group your fields, create an adequate group. Name it, assign a color and enable to start using it. Similarly to groups, in this section you also may add statuses that later on will be used to segregate fields. 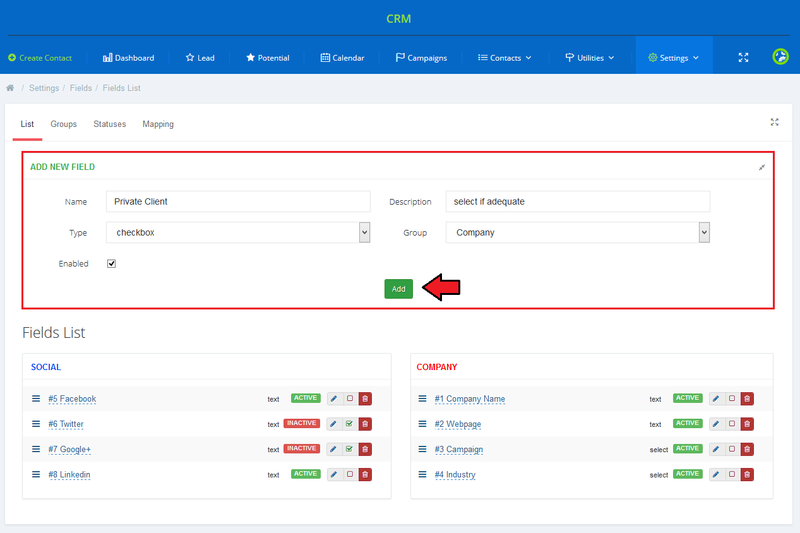 'Fields Mapping' option allows you to connect CRM fields with WHMCS standard or client custom fields. 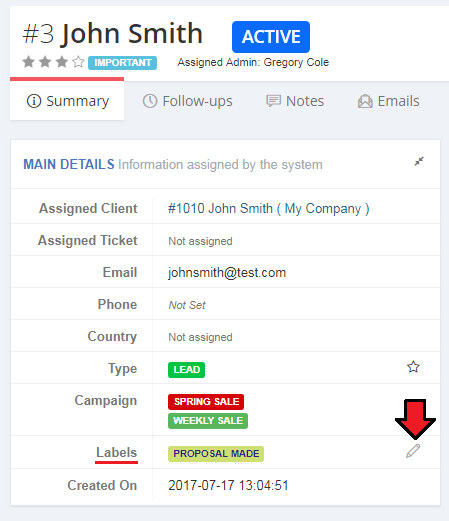 In this way, during creation of a contact from client's ticket or a adding client from a contact, mapped fields will be automatically filled out. 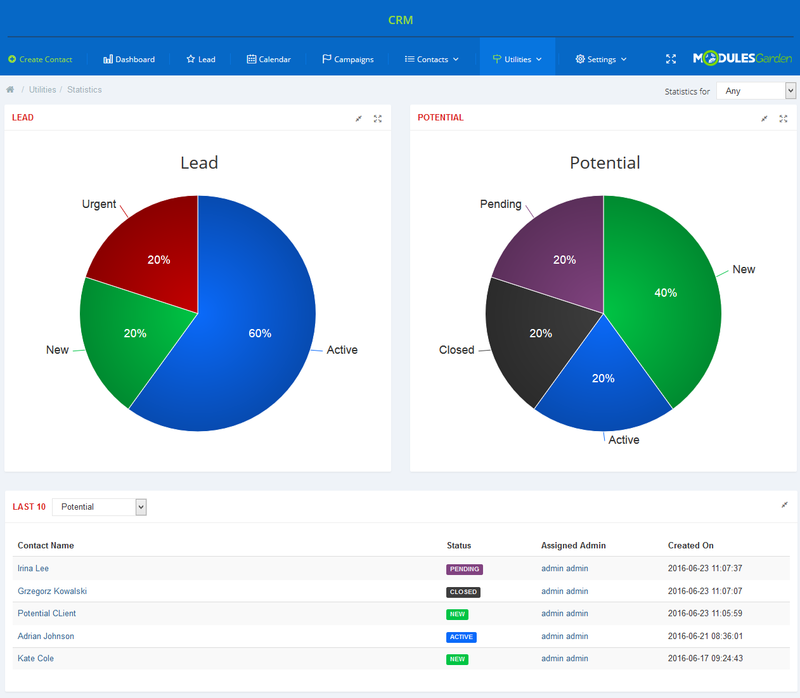 'Leads' and 'Potentials' are the only predefined contact types that are available from the moment you start using your CRM. 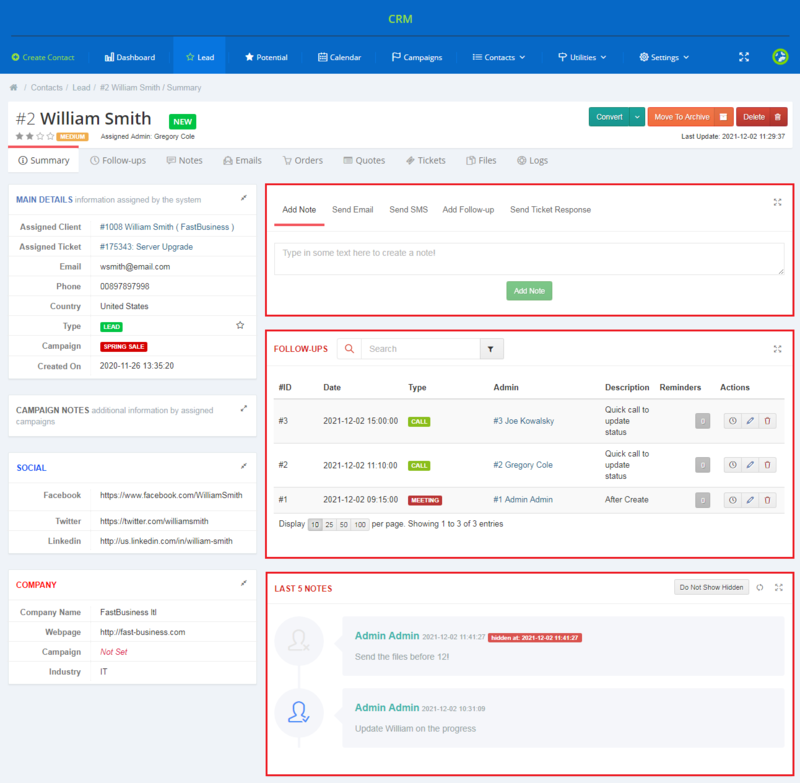 However, to make CRM for WHMCS even more customizable and user-friendly, we have implemented a function allowing you to create and manage your own contact types as well. To add a new type, simply fill out the form as shown on the screen below. Dashboard - if you select this option, the new type will be visible on the dashboard, and you will be able to filter the view by this type. Press the 'Add' button to finish the process. Under the creation form there is a list of all available contact types, together with the predefined 'Leads' and 'Potentials'. Any changes made in this section require reloading the page or clearing the browser cache! Changes to contact types are not applied immediately. If you want to delete a contact type, you will be asked to choose another type to which any contacts from the deleted type will be reassigned to. If you do not want to reassign the contacts to another type, you can move them to the archive. To do so, simply select the 'Move to Archive' option. Still, you will have to choose a type for the contact. It will be used in case you decide in future to restore these contacts from the archive. The last section in the 'Settings' tab is responsible for assigning permissions to certain roles of group of administrators. Once you have added a new role, use action buttons to move the page where you can choose particular permissions for the group. 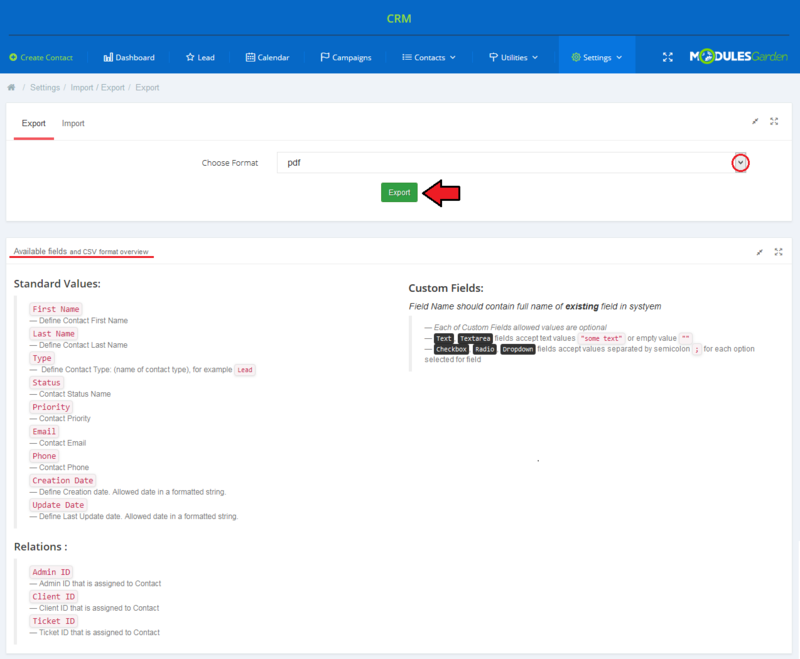 In order to export a file from your CRM system, simply choose a target file format (CSV, XLS, XLSX, ODS or PDF) and press the 'Export' button. A file with the complete list of contacts available in your system along with their details such as name, type, priority, phone etc will be downloaded shortly. A list of available fields that can be included in the file for either import or export are available underneath. Important: It is required that you use only the fields that are visible underneath. In case you name your columns in any other way, the import action will fail! 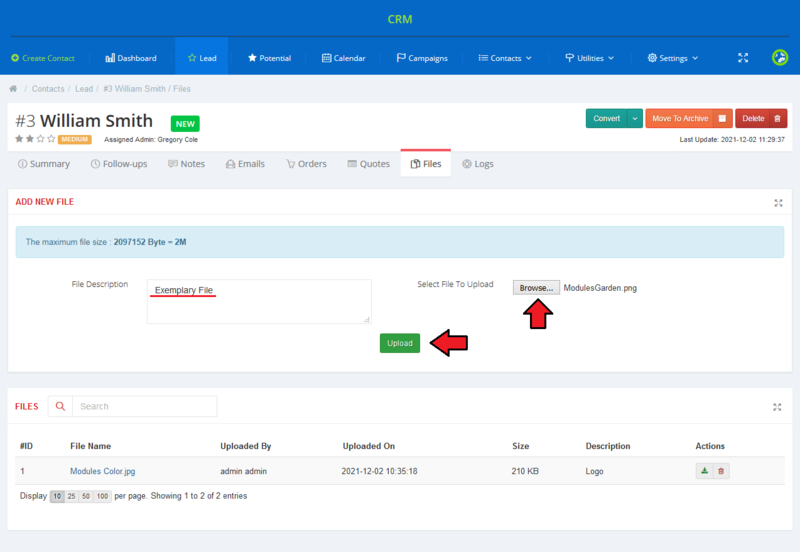 In order to import a file to your CRM system, simply select a file from your disc and press the 'Upload' button. Note: you can upload files of 'csv', 'xls', 'xlsx' or 'ods' formats only. Web Forms give your the possibility to collect contacts' details from different sources. 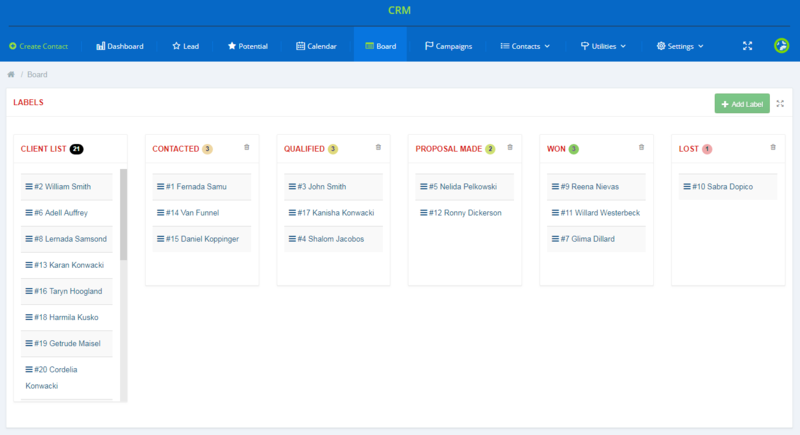 In your CRM you may generate sample web forms which you can then locate in your external sites. Your customers then will fill out their data which will be automatically delivered into your CRM. Creating new contacts is now much faster and easier. Proceed to 'Settings' → 'Web Forms'. You will find there a list of all already created web forms. You may edit or delete them at any time. Here you will also find a raw HTML code of the web form, which must be used to locate it in your desired web site (see action buttons). Press the button marked on the screen to create a new web form. Define contact type for a new customer and its initial status. 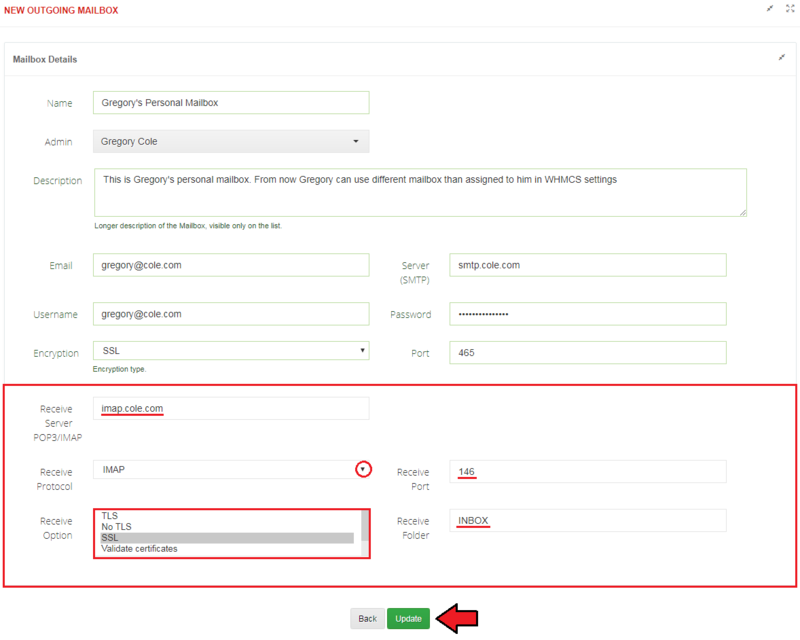 Optionally, choose administrators who will be informed about the addition of a new client from a web form. Additionally, you may select fields that will be visible to fill out. Drag a field and drop it in the currently created web form box. Once your web form draft is ready, you have to manually add it to the desired location. 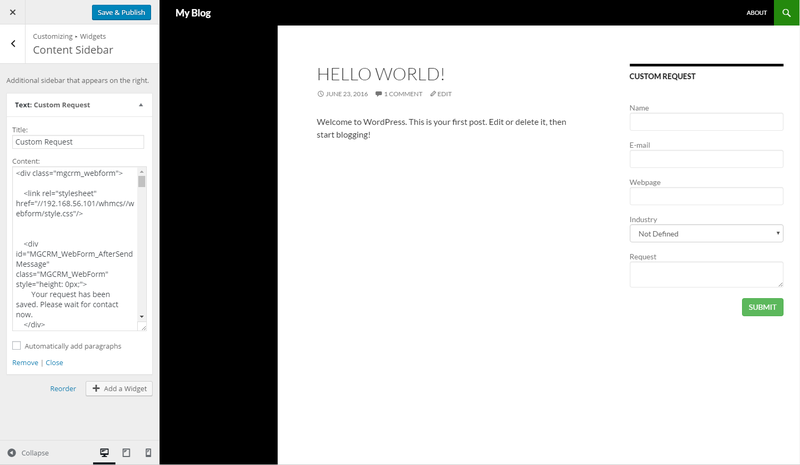 Underneath, you will find a sample instruction on how to add a web form as a widget to the WordPress application. 1. Log in to your admin area on your WordPress. 2. Move to 'Appearance' → 'Widgets' and press 'Manage in Customizer'. 3. Select 'Widgets' → 'Content Sidebar'. 4. Press 'Add a Widget' → 'Text'. 6. Paste the HTML code copied from your web form into 'Content'. Congratulations! 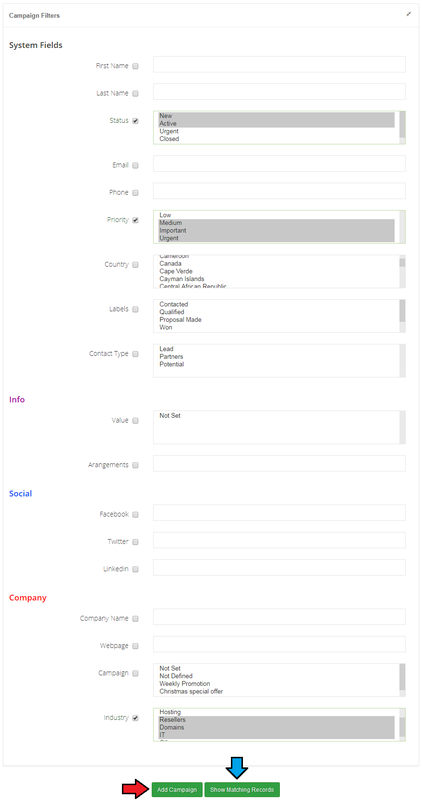 Your web form with empty fields that can be filled out by your clients is ready for use. If your clients provide the required data, new contacts will be automatically added to your CRM. Automations allows cron to automatically add reminders and follow-ups based on the chosen rules. To start, you need to first create a new automations group. Enter a new group name, enable the option and press the 'Add' button. Now, move back to the automation group list and press 'Edit' next to a newly created group. You can now start adding new rules to the group. First, press the 'Edit Rules' button. Now, click on 'Add Rule' and then select a new condition from the dropdown. Afterward, press 'Show Form' to expand triggers for the selected condition. Depending on the chosen condition, select desired triggers and press 'Update' to save changes. Now, to set the action that will be triggered after the provided condition, you need to add a new sub-rule to it. Add the desired action in the same manner as you added a condition before. This is an example of a simple rule. When a 'Proposal Made' label is assigned to the contact, then an email reminder will be sent to the administrator. When enabled the next time, when the cron is iterated, the rule group will be triggered. Note: You can insert as many sub-rule into rules, and events into other sub-rules as you want, but make sure that the conditions you specify are correct so that the whole automation group can be still triggered. 'Statistics' contains graph concerning all your contacts. The available graphs show for example: the number of contacts per status, new contacts per admin, per month and per day. Additionally, administrators with extended permissions are able to view statistics of other administrators. 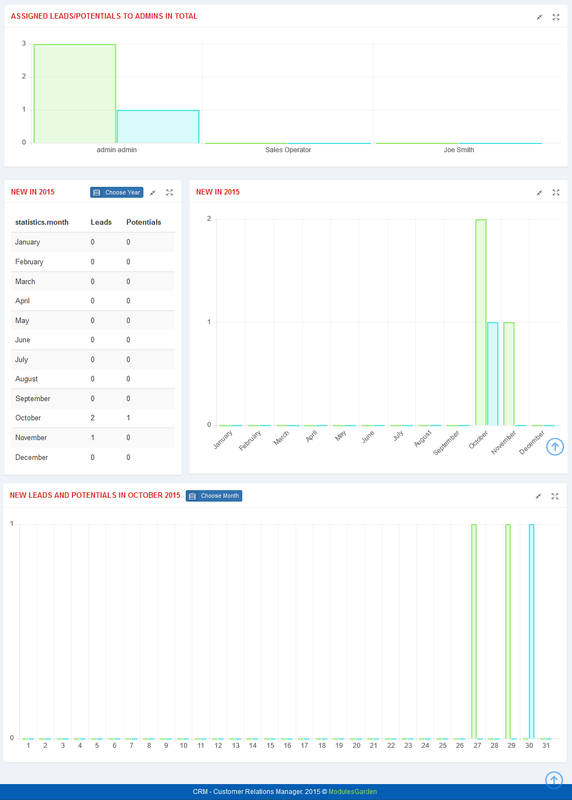 In 'Statistics' you can find the overall information such as graphs concerning contacts with a chosen status. See the list of recently added contacts with details such as assigned admins, status or creation date. There are also graphs and statistics tables presenting the number of contacts added within certain periods of time (year/month). 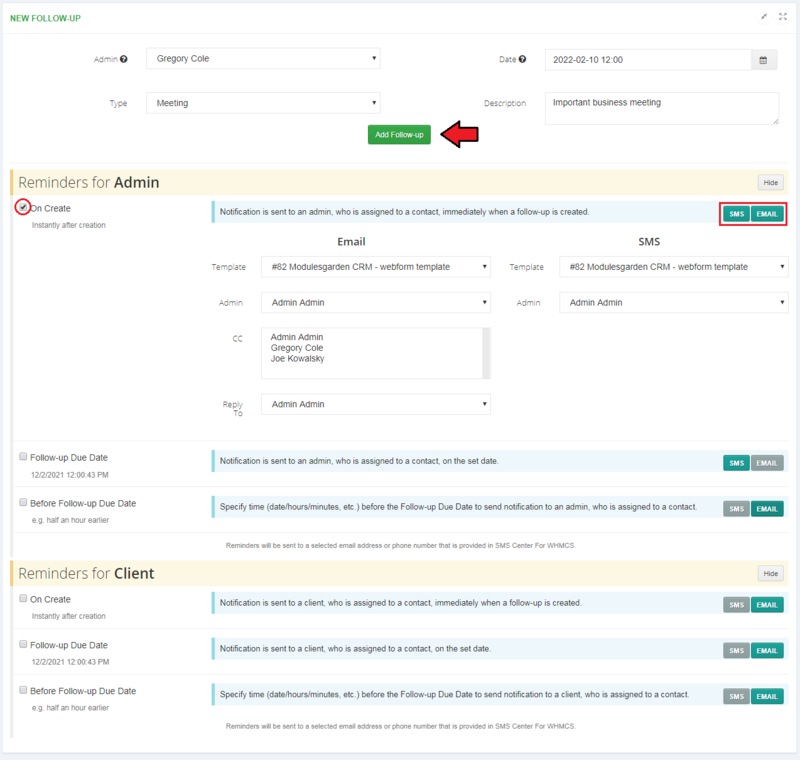 In this section you can manage any notifications that shall be delivered to any administrator depending on the configuration. Let us check how it works. Press 'Create Notification' to begin. You will be moved to the 'New Notification' creation form. Fill out the data to tailor the notifications perfectly to your needs. Choose the 'Type' from 'Temporary' and 'Permanent'. Mark administrators that this notification will be displayed to. Naturally, you may select more than one admin. In the 'Message' field simply type in the text of the notification. You are allowed to use HTML code here. 'Hide Once Accepted' - decide whether accepted notification should disappear from the widget. Press the 'Create Notification' button when ready. 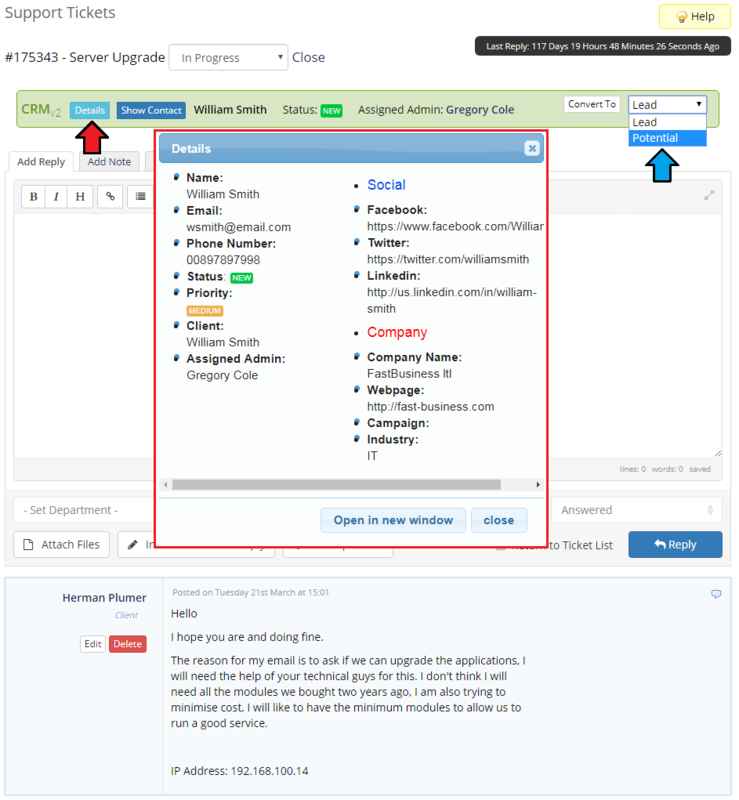 Created notifications are visible to admins on any page of their CRM system. or once they have been accepted if the 'Hide Once Accepted' option was enabled. You may easily hide the notification by pressing the icon in the top right corner of the widget. 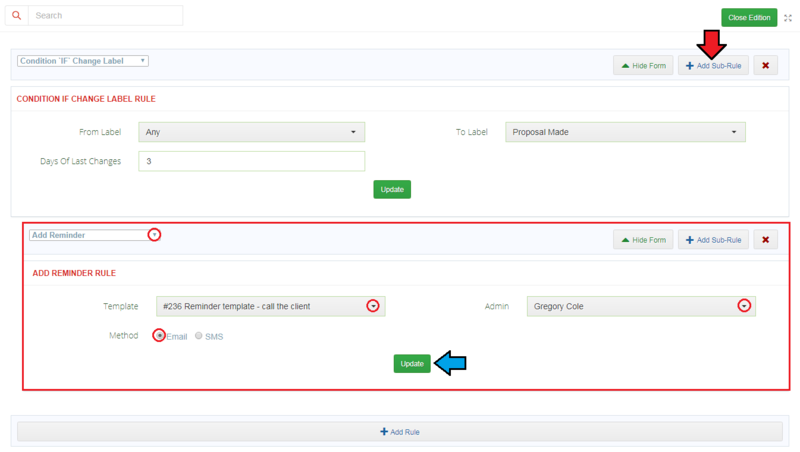 Configure mass message templates that can be used in your campaigns. *Choose a group the messages will be delivered to. These can be single users, groups of users or campaigns. In the archive you will find the list of no longer used contacts. Use action buttons to delete them completely or convert back to a contact. You can also perform the same action on multiple selected contacts at once. In the 'Received Messages' section you have access to all received messages stored in your incoming mailboxes. 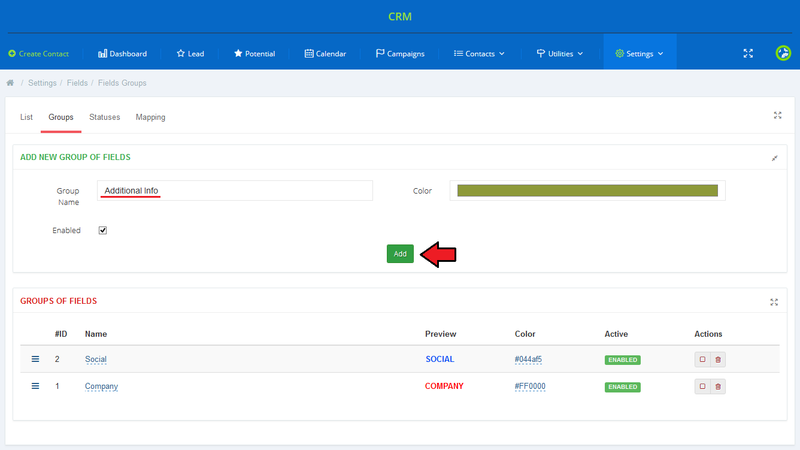 In addition, in the 'Resource' column you will see the name of the clients if their email addresses are already linked to the CRM contacts. 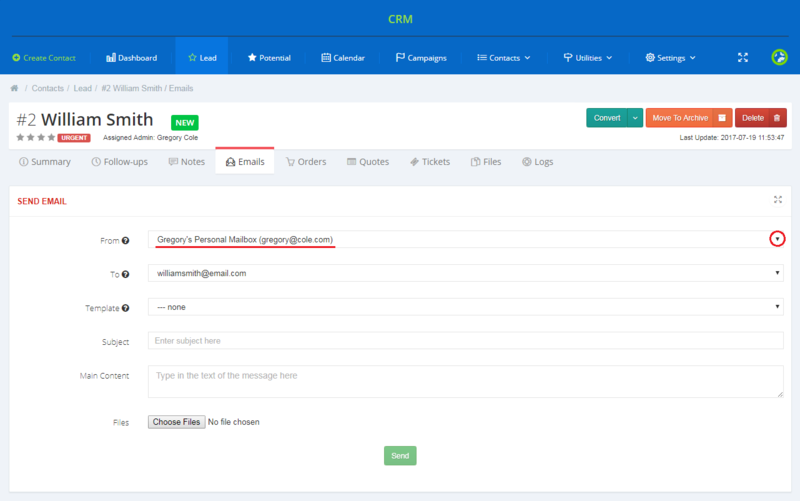 However, if the received message is coming from an unknown email address, you can directly create a new CRM contact by clicking 'Create Contact' . Of course, you can also view the received messages by clicking on their subject, which will open a new window with their content. 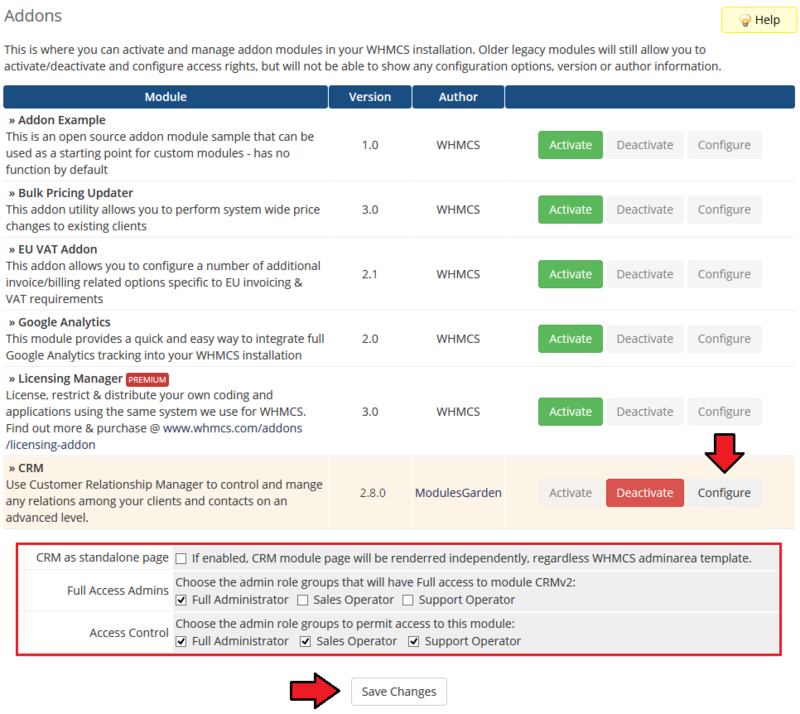 Our module offers additional integration in your WHMCS support tickets system. 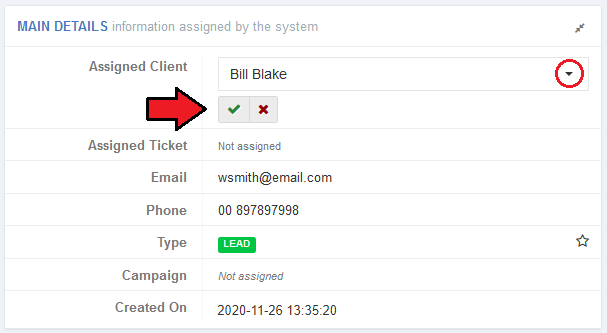 As you can see on the screen below, your support operators can convert tickets directly into Contact Lead. In this way you can track relations with your clients. 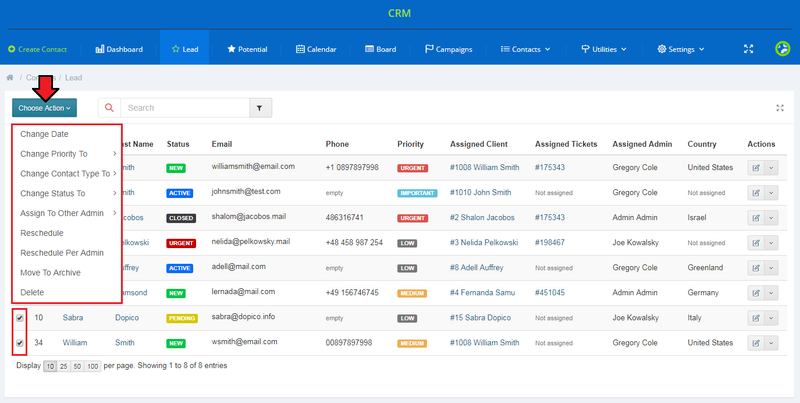 Any ticket from a given client will be displayed with the contact name, status and assigned staff member. Additionally, after pressing 'Details' , extended information about the contact will be displayed in a pop-up. Note: Any contact can be transferred between the available types from the ticketing system as shown below (blue arrow). 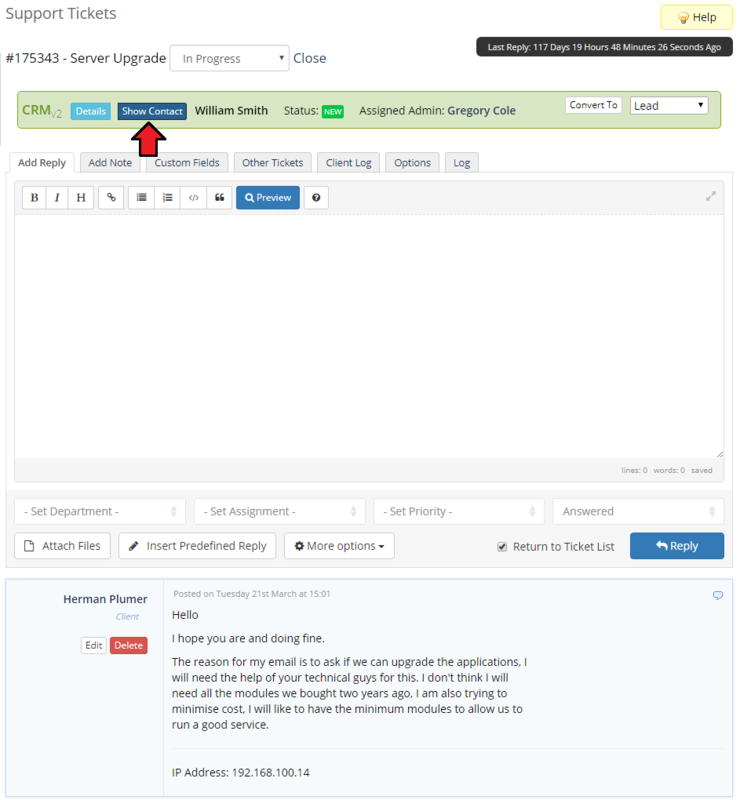 Your staff will be also able to quickly move to the contact profile in CRM For WHMCS by pressing 'Show Contact' . Integration with Asterisk VoIP Center For WHMCS extends your possibilities with ability to originate calls to your CRM contacts. As soon as you install the module, you can originate a call by pressing the 'Call Out' button. If everything is set up correctly, you should see something similar to the screen below. In order to familiarize you with the module even better, we are presenting here a sample workflow. Full Access Admins - admin role groups that will have access to every aspect of the module. Access Control - admin role groups that will have access to the features specified in the 'Permissions' section. Let us assume we have admin X with full privileges and admin Y who has permissions limited to a sales person. 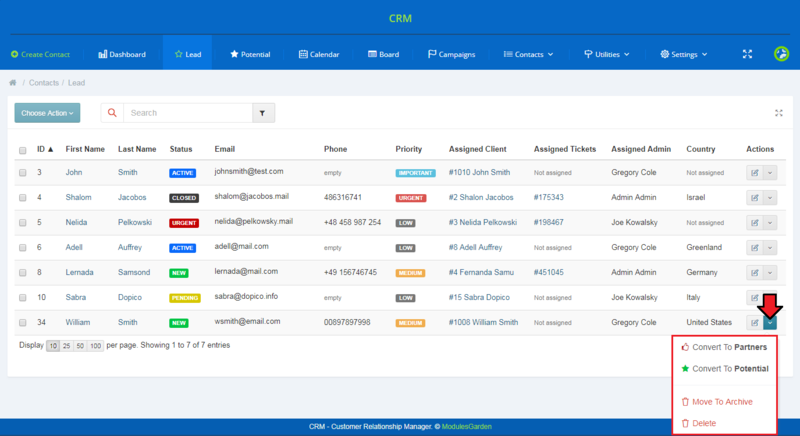 The admin X obtains a new contact which is called Company X and creates a Lead profile in CRM. Additionally, he/she assigns the admin Y to the Company X and leaves some notes in the profile. The admin Y can now read these notes and choose newsletters and promotion notifications from email templates. He/she sets them as follow-ups spread over the next two weeks. Luckily, one of the newsletters draws the attention of the Company X. They respond to the newsletter, so the admin Y changes this contact type to Potential. In this way he/she can track the relation with that contact more easily. After a few emails with the Company X, the admin Y decides to prepare an interesting offer for the contact in the form of a quote. Once the quote has been accepted, the admin Y creates a client account for the contact. 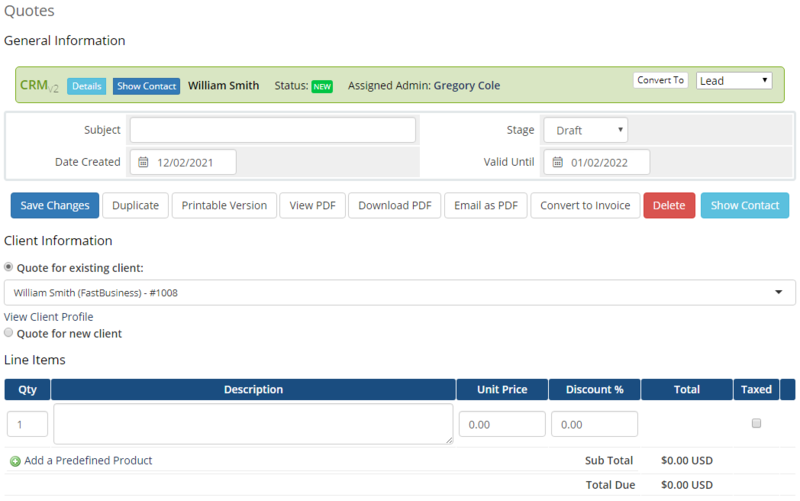 Additionally, owing to the integration with Quotes Automation For WHMCS, he/she is able to quickly generate the invoice & order from the quote. The following month a few more offers are accepted, and both your company and the Company X benefit from it. All this time admins X and Y can easily track their contact with the Company X. Thanks to the quotes in the contact profile, they can see all current offers made for the Company X. While notes and files can give them more information about progress in making current agreements. 1. 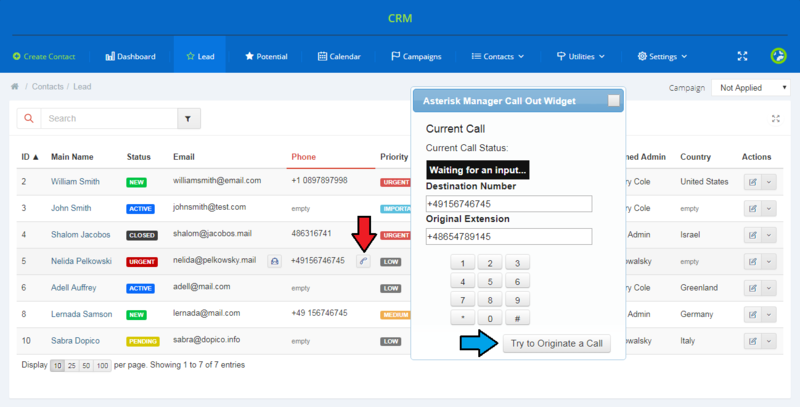 If you want to see a specific part of your CRM, a single widget only, use full-screen mode for widgets. 2. In the addon directory you can find the 'configDB.json' file which is used to setup by default the UTF-8 coalition and character set encoding for the module. You can simply edit this file according to your needs, or remove it to force the module to automatically obtain the configuration from your database source. 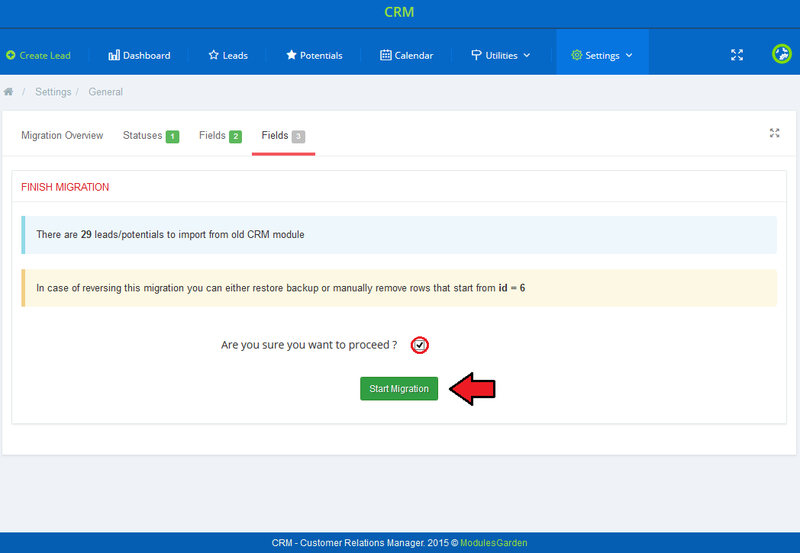 If you have already used any of the previous versions of CRM, the very first thing that you need to do with your module before moving to any further is migrating the data from previous CRM to CRM V2.0.0. To do so, move to 'Addons' → 'CRM' → 'Settings' → 'Migrator'. Please note that not all data can be migrated due to some incompatibility between systems. Important! Before you proceed to migration itself, you must always make a backup copy of your database for safety reasons. In this way you will not lose any data in case of any unpredictable issues and will be able to restore the previous version. If you fulfill all conditions, press 'Begin Migration' to start the process. 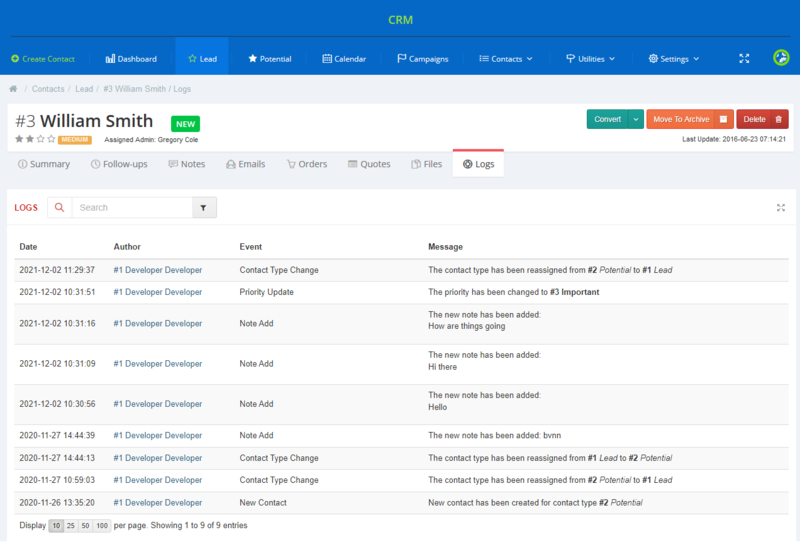 Prepare mapping of statuses used in CRM V 1.2.4 that you wish to map to CRM V2.x. Confirm that you have finished the mapping correctly and then move to custom fields mapping configuration. 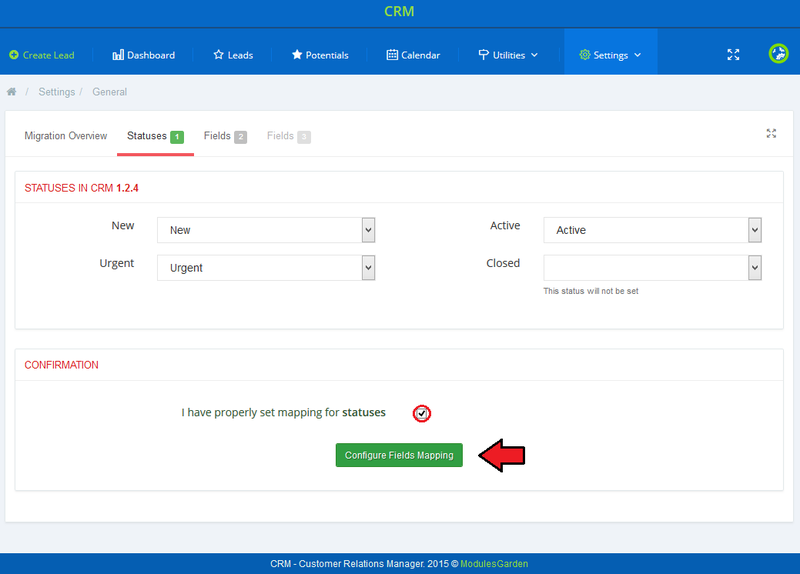 Display map fields used in CRM V 1.2.4, confirm proper configuration and move to the last step. Read carefully all the information about migration consequences, and if you agree with them, start the migration. Congratulations! You have successfully migrated your database from previous CRM to the latest version! Now, you can enjoy a much improved management of your contacts with potential clients. your .htaccess or vhost do not block the module in any way. Please note that admin folder may have a custom name. Remember to adjust its input to your naming. 3. If you get an error saying that 'Directory <your_whmcs>/modules/addons/mgCRM2/app/Storage is NOT Writable. Unable to continue.' , please make sure that this folder has writable permissions set. Please note that the admin folder may have a custom name. 5. 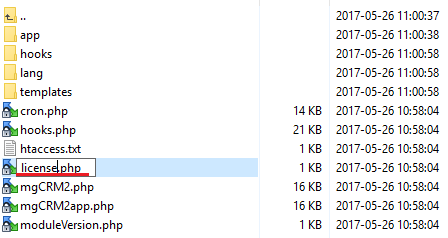 If you cannot see the import and export options for the .XLSX or .ODS formats, please make sure you have the PHP Zip library installed on your server. Otherwise, you will not be able to use these extensions. 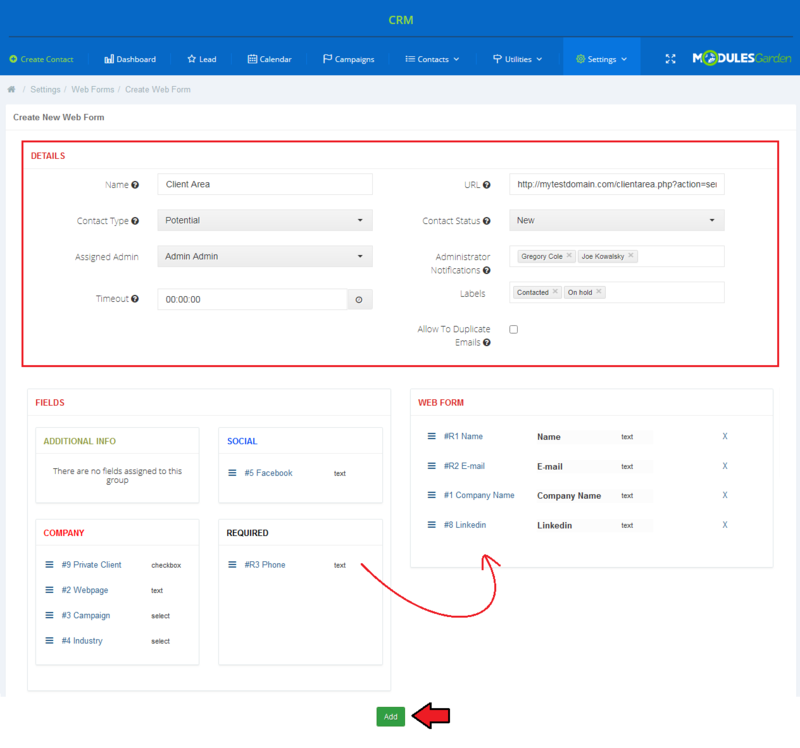 This page was last modified on 2 April 2019, at 13:36. This page has been accessed 119,699 times.